We are enjoying the sunshine now in Arizona. It is a little different being here for Christmas. Christmas is our favorite time of year to have a little snow on the ground. Guess it won’t happen this year for us, but we are enjoying the mild (60-70 degree) temperatures. 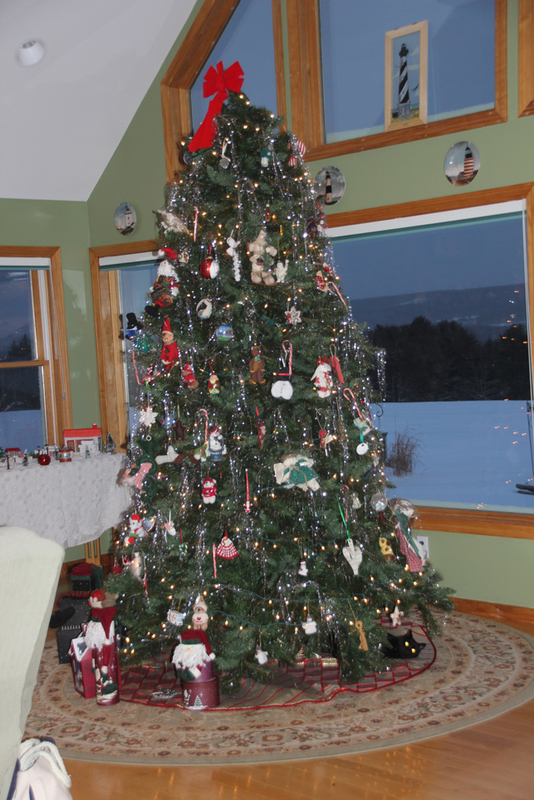 Fond memories of our Christmas tree from 2001 to 2017. Shelby got his haircut for the holidays and the groomer took his picture. He is not thrilled with the head gear but he was a good sport. 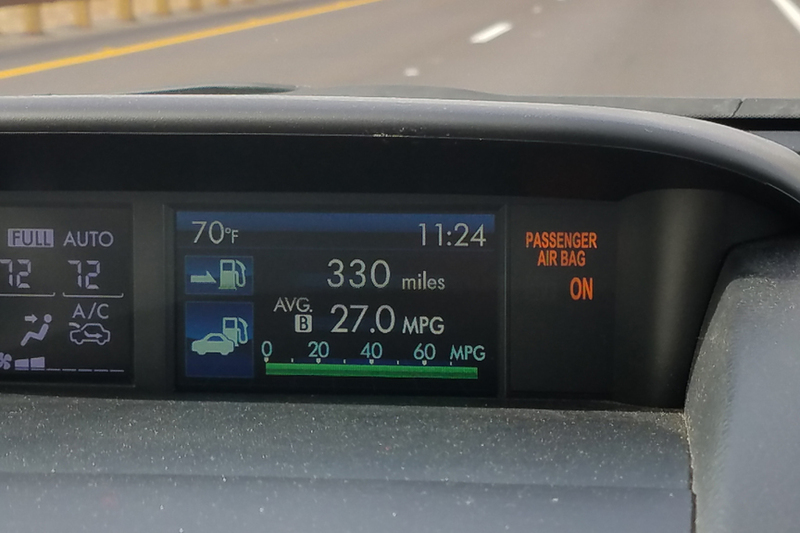 Our trip from Maine to Arizona was good. We were able to stop at friends and relatives along the way which helps break up the long trip. It was a 10-day odyssey but uneventful which always helps. Shelby is great to travel with so he is no problem. Most of our time here has been spent either grocery shopping, playing pickleball or walking. We get 2-3 long walks a day on the golf course. It is a non-working course which is good for us to take Shelby on. 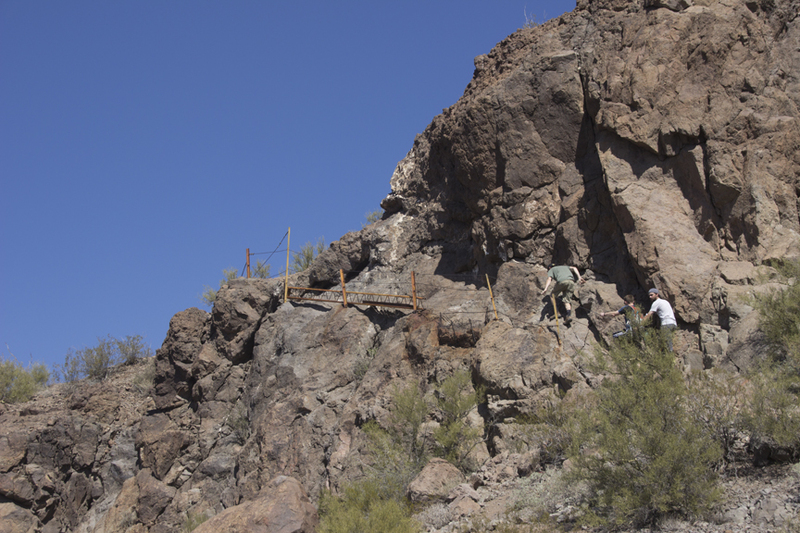 One of our favorite hikes out here is Pass Mountain in Usery Park. 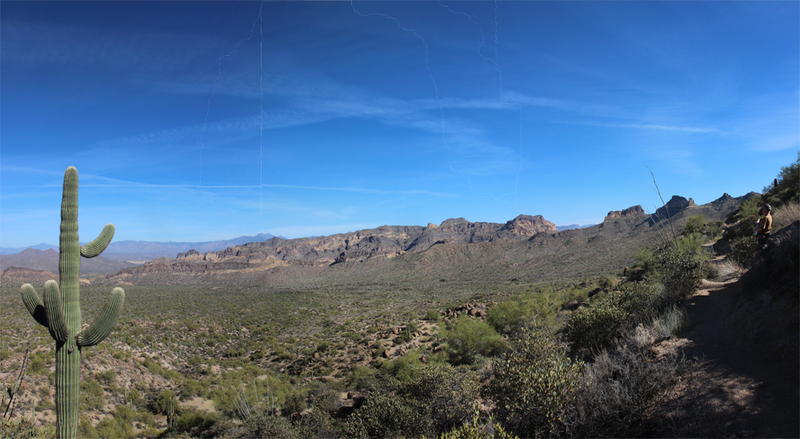 It is a long (7 miles) but a fairly easy hike and there are nice views along the way. The day we went was nice and sunny but not real hot which made for a nice day. We even saw three wild horses not too far from the trail. I did proceed to twist my ankle half way around. It seemed fine until I took my shoe off and, of course, then it swelled up. I had to stop pickleball for a few days but I’m back again playing. 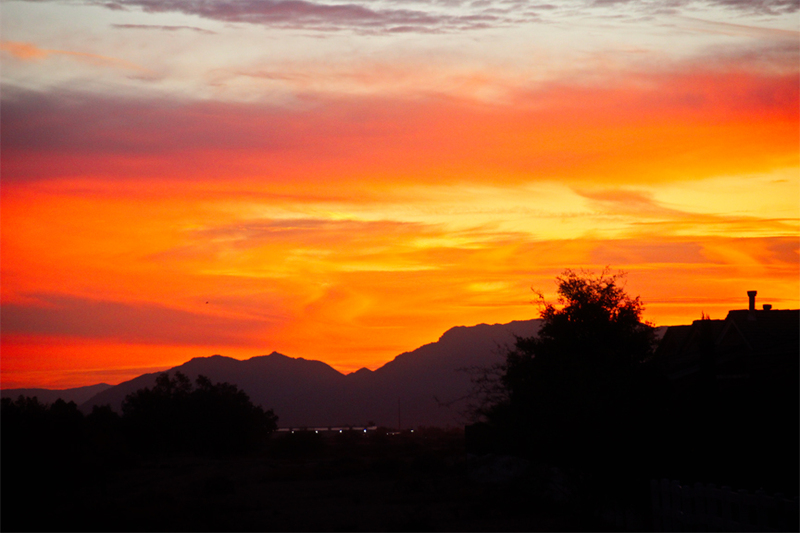 We have been looking to buy a property here in this Eloy community. There have been a few on the market and we hope to make a decision soon. We are here until April 30th so have lots of time to find something. 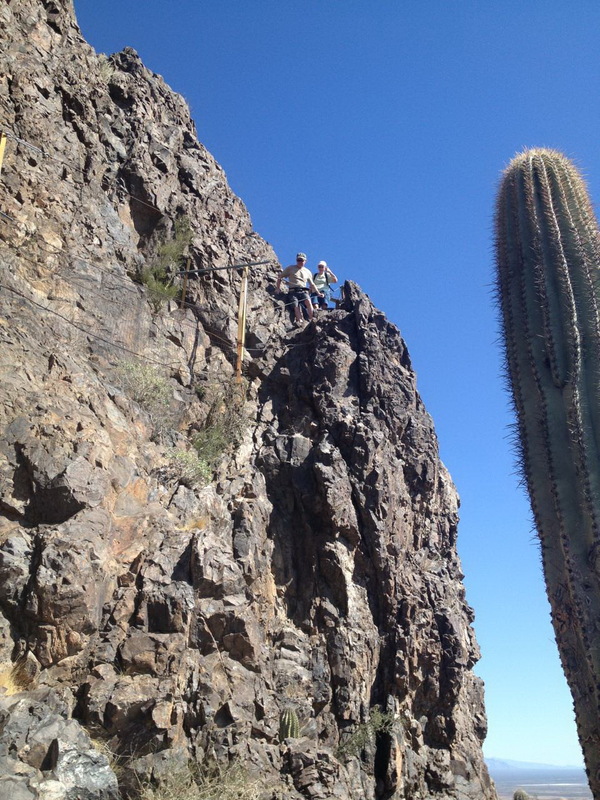 We will then plan on splitting our time between Cutler, Maine and Eloy, Arizona–having the best of the seasons. 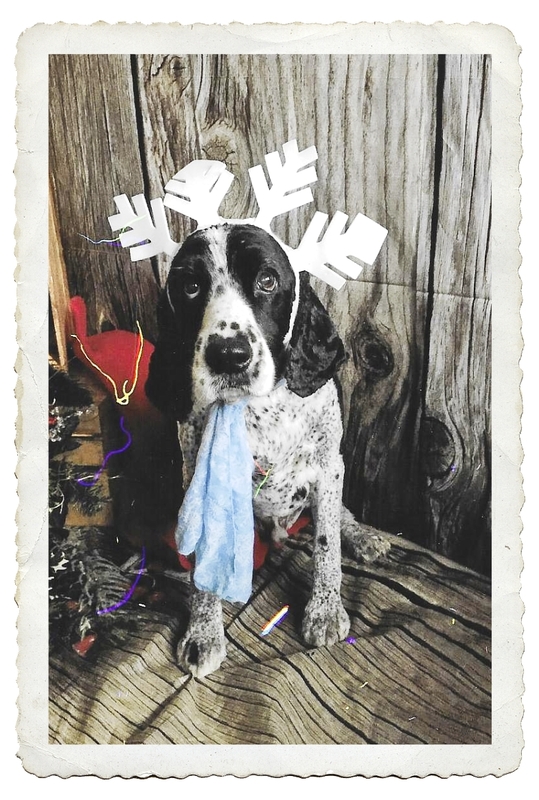 Since we didn’t get cards out this year, this is our “Christmas blog card”. 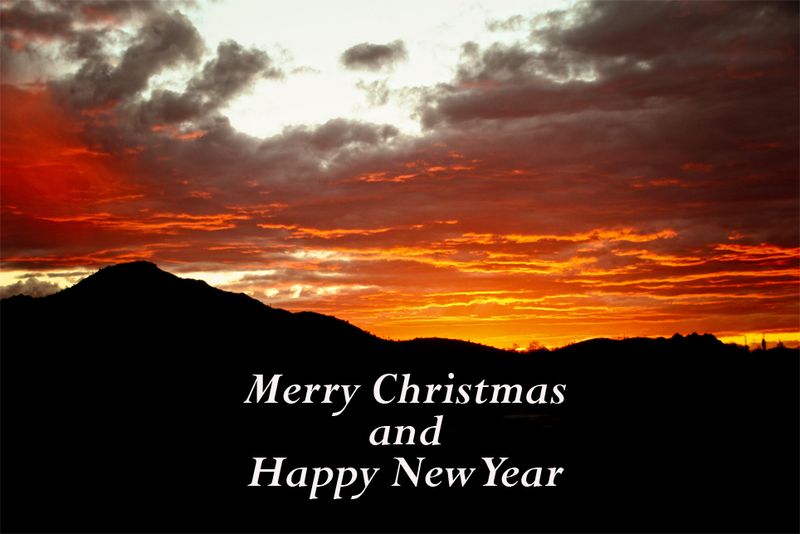 We wish you all a Merry Christmas. May 2019 be a great year for everyone. 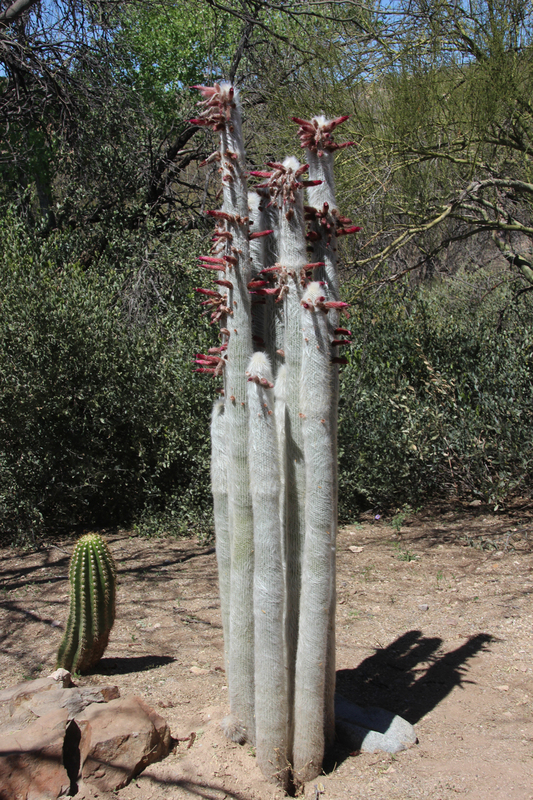 Boyce Thompson Arboretum is the largest and oldest botanical garden in the state of Arizona. 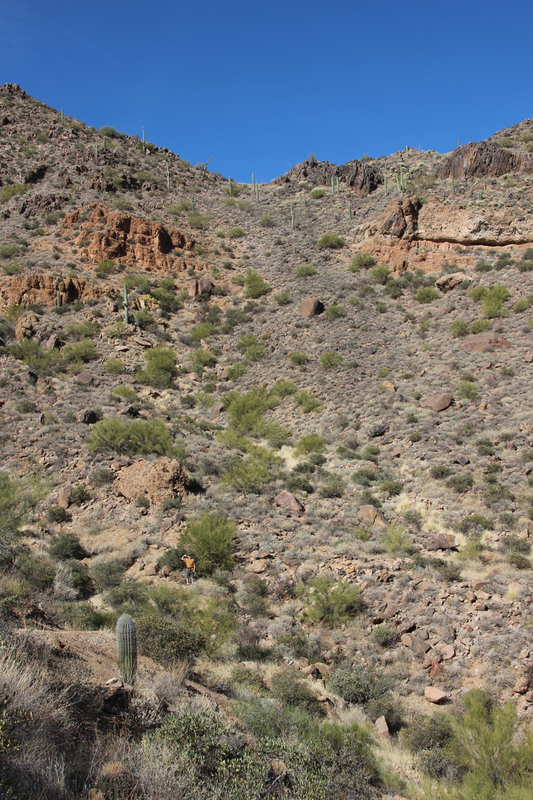 It is one of the oldest botanical institutions west of the Mississippi. 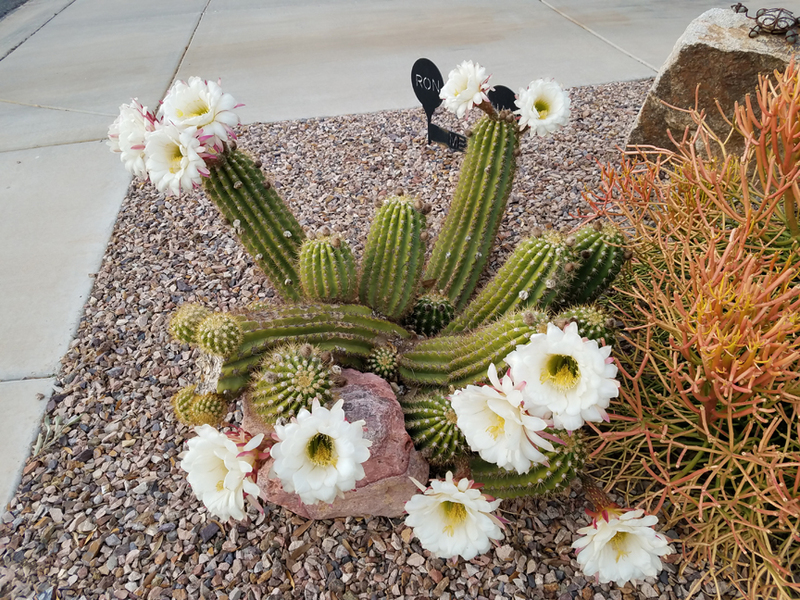 We thought we would see more of the cactus blooming while we were there but it seems the dry weather has slowed down some of the blossoms. It was still a nice trip with some great views to enjoy while walking around. 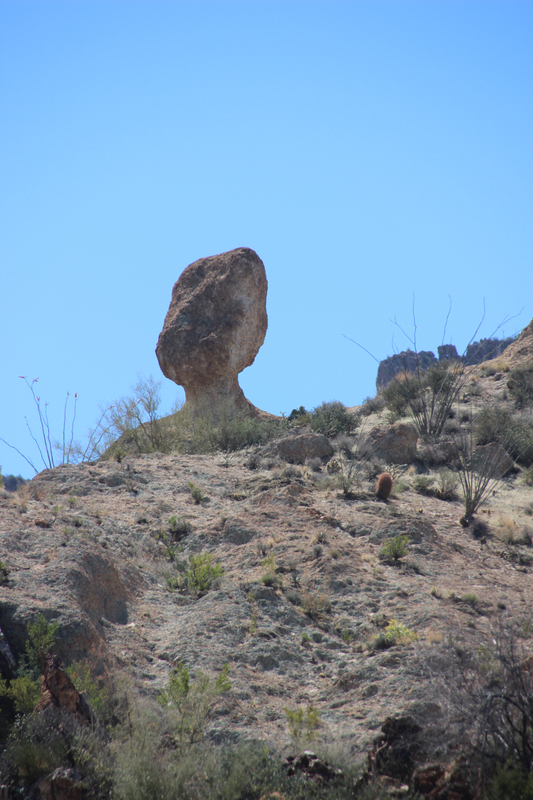 Reminded us of Balanced Rock in Arches National Park, Utah. Another view while walking along the trail. Cactus just starting to blossom. Our next day trip was to Mt. Lemmon. This was a longer drive from our house. It took about 2.5 hours to get there but it was worth the trip. 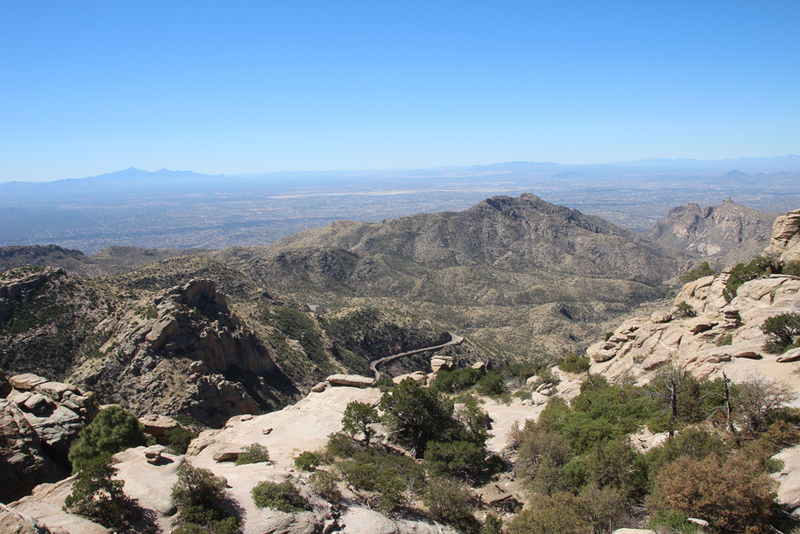 It has a summit elevation of 9,159 feet and is the highest point in the Santa Catalina Mountains. It was 82 degrees at the bottom and by the time we got up to the top it was 52 degrees. There is even a ski lift for skiing here. I don’t think they got much snow this winter for skiing, however. There are four different alpine zones. 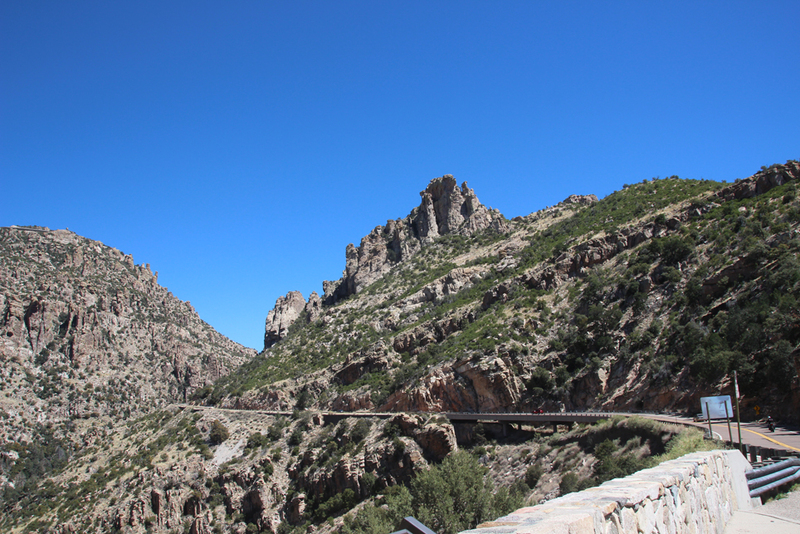 A long, winding road takes in some very scenic views. It starts at the bottom with plenty of cactus and at the top lots of pines trees where we felt a little more at home. We have explored as much as we could this year. Next year we plan to come back to Eloy again. We are staying in a different house but in the same community. Our three months have flown by and the weather has certainly made our stay worthwhile. We leave for home on Monday and will arrive in Washington on April 16th. 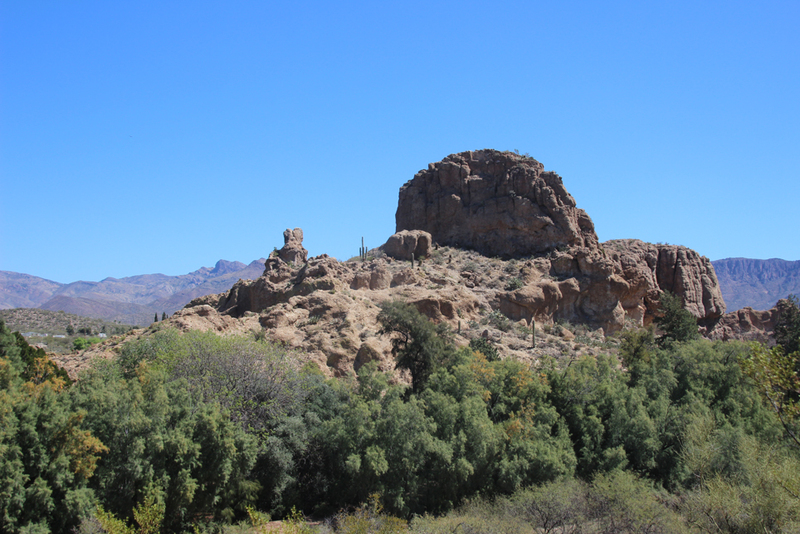 Hope you have enjoyed seeing some of our pictures of Arizona. Here are a few parting pictures…. Shelby and John doing what they do best–relaxing. 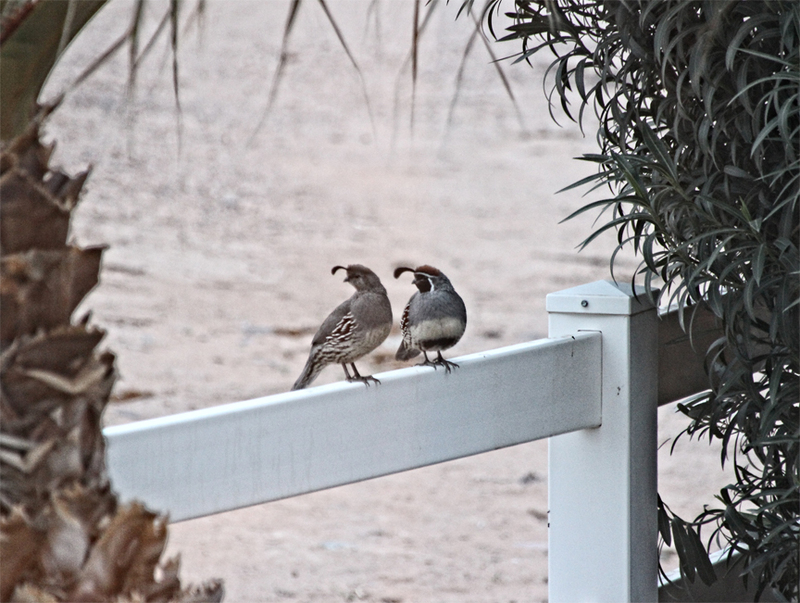 Love the quail that sit on our fence. 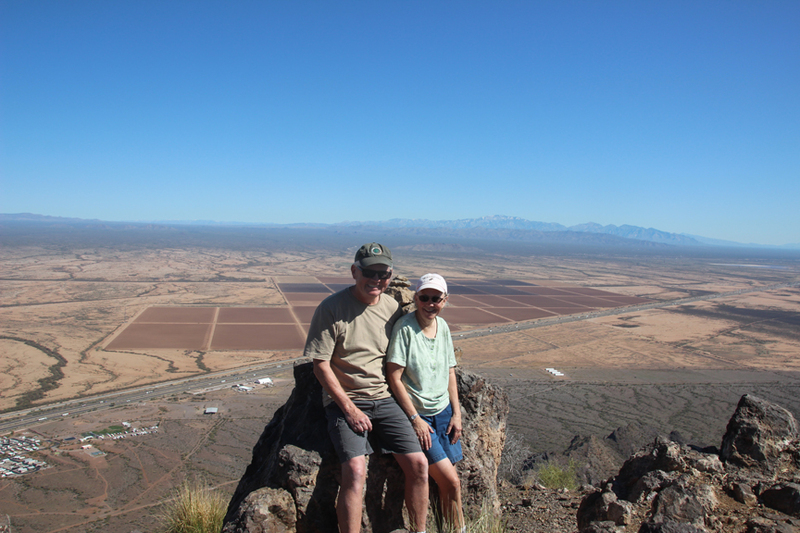 We have done a lot of hiking around the country but nothing can compare to hiking Picacho Peak. 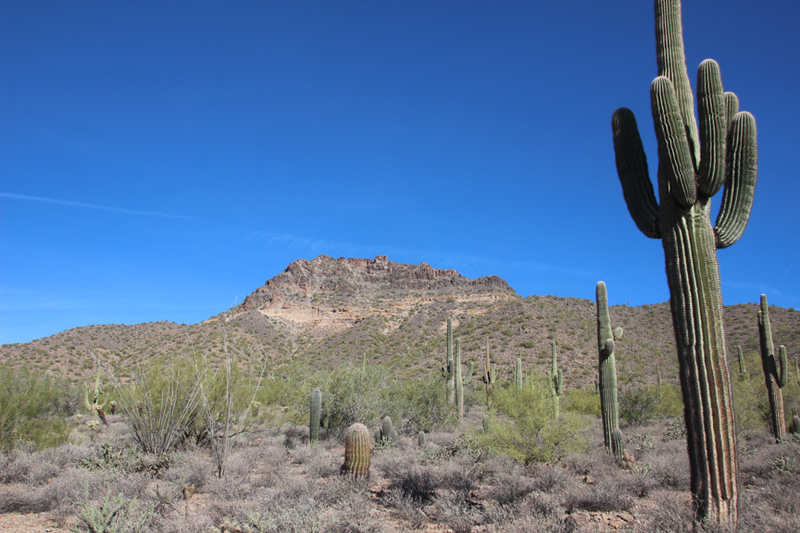 The park is located between Casa Grande and Tucson and not too far from where we are staying. 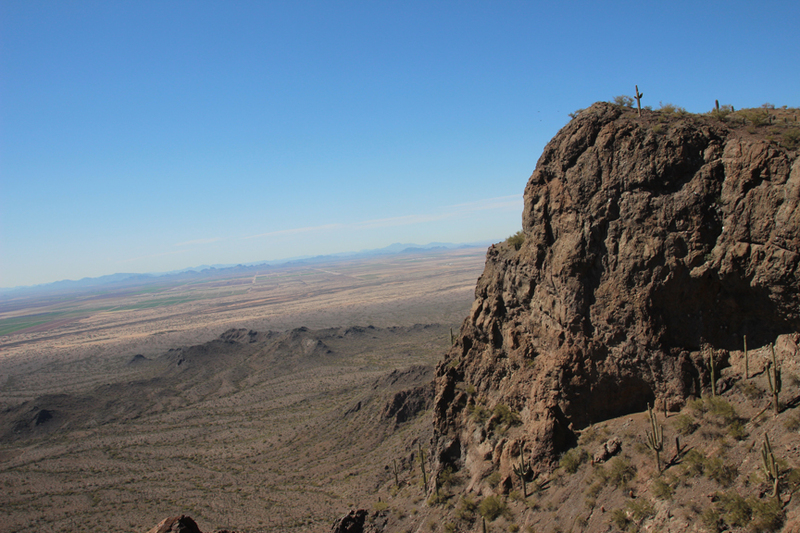 It is a 3200-foot peak with an elevation gain of 1500 feet, 6.2 miles round trip which isn’t bad until you come across all the cables, rungs and rocks where you have to use lots of upper body strength to get to the top. 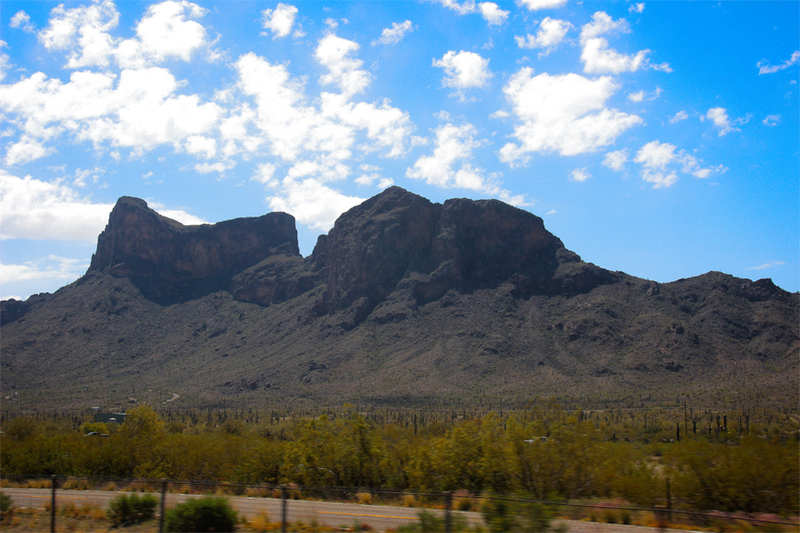 View of Picacho Peak doesn’t look too intimidating from the highway. The first 2 miles is pretty flat and gives a false sense of security and ease in walking. Then you hit the first cable section and it’s all over after that. I lost count of the number of cables and rungs but it was very challenging. View as we were walking. View part of the way up. One of the walks across the rocks. 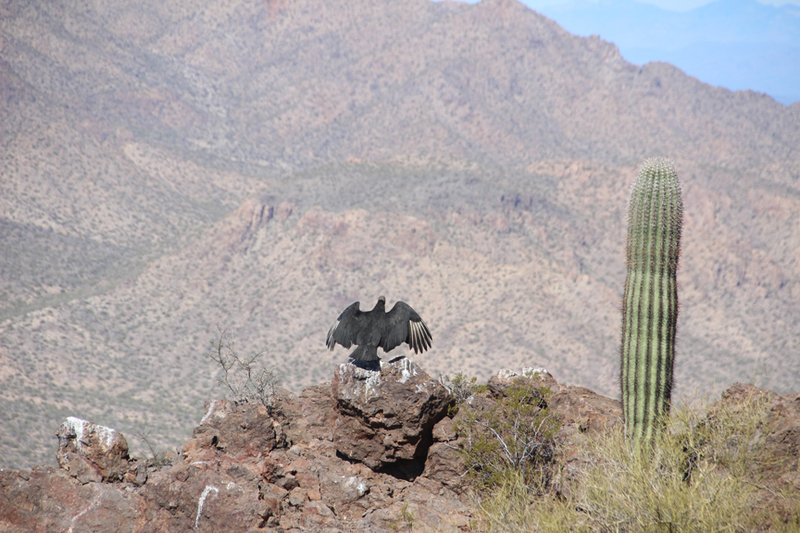 Vulture spreading his wings near the top. Ken and John after climbing for 2-1/2 hours. 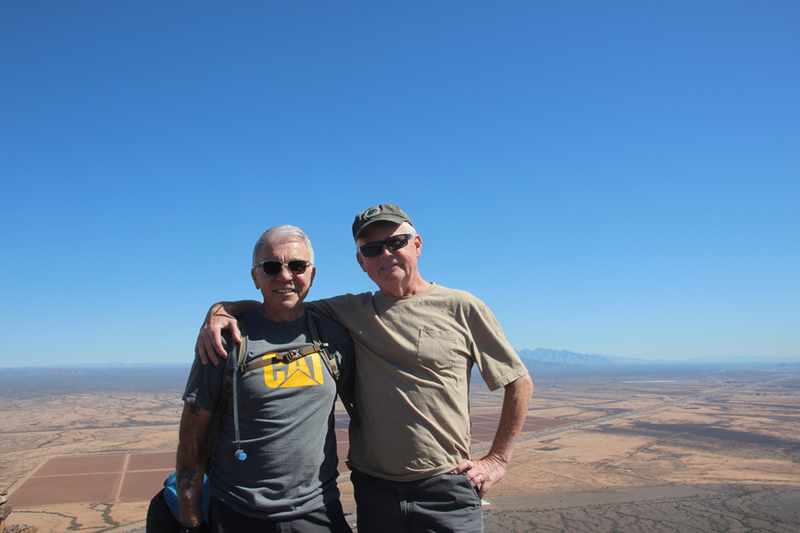 John and Ken are ready to do this hike again. Me? Maybe not so much. I’m glad I did it but not sure if I want to do it again. 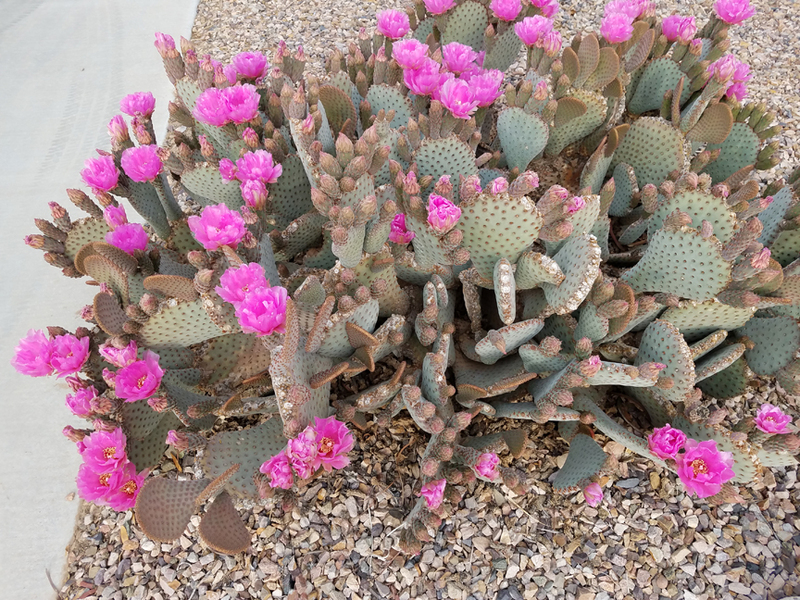 Flowers are now starting to bloom in the desert. Here are a couple of beauties that have bloomed down the street from us. We were told this cactus only blooms for one day. Lots of flowers on this beauty. 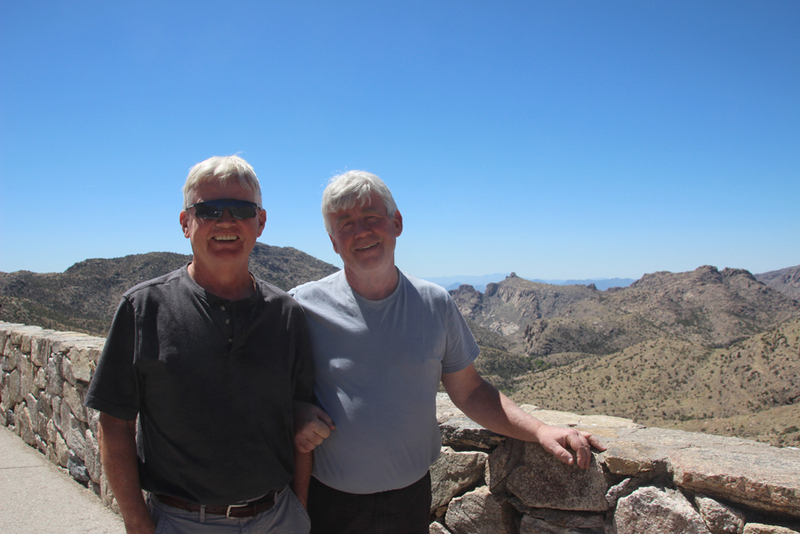 We took another trip to Saguaro National Park with John’s brother, Frank. 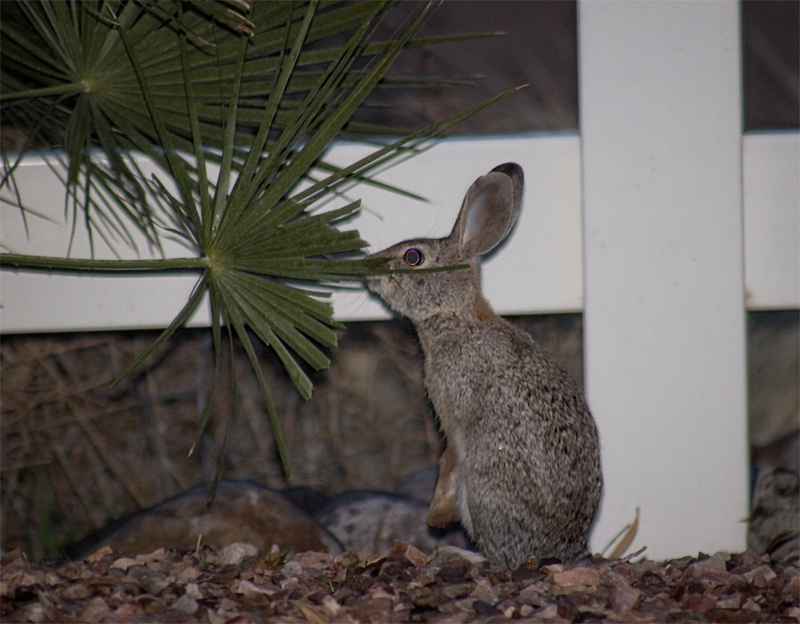 A nice day to be outside and see the desert plants. 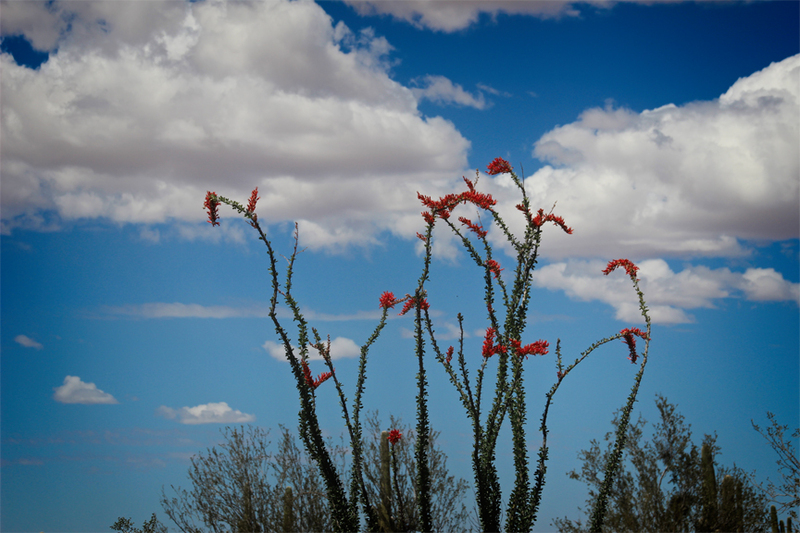 This ocotillo plant was blooiming in Saguaro National Park. 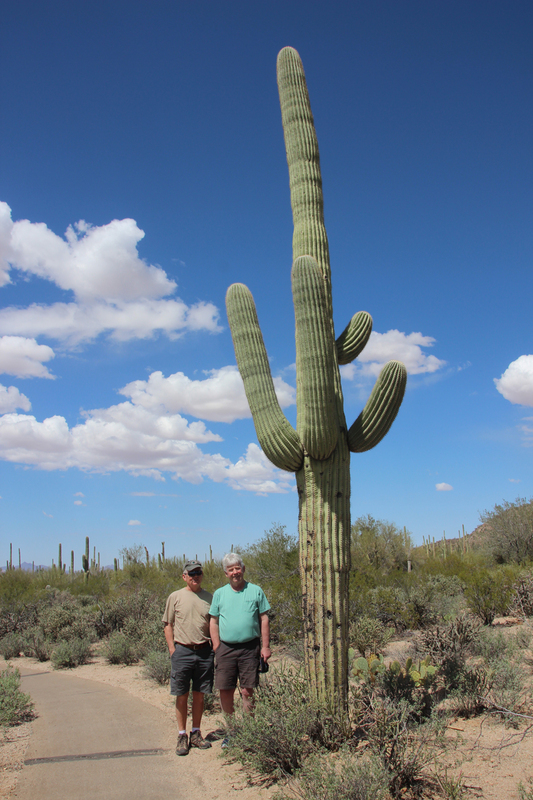 John and Frank looking very small next to the saguaro. That’s all from Arizona for now. The fun thing about having visitors is not only the great company but exploring places we haven’t seen. My cousin Pam and her husband Ron were out for a week. We kept them busy going to Mesa and Tucson and even got in a little pickleball with them. 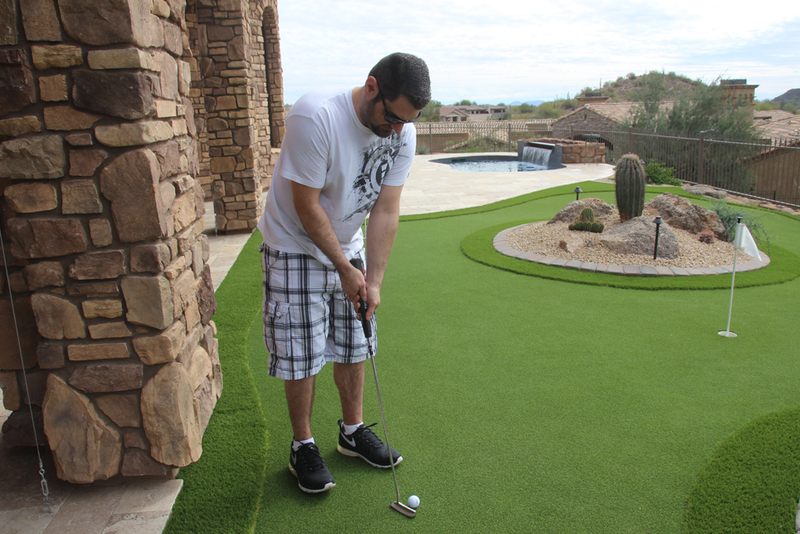 We went to Nancy (sister) and Ed’s house and the guys got a chance to try out the putting green. Andrew at the putting green. John showing off his golf techniques. Notice the beautiful view of Mesa in the background. 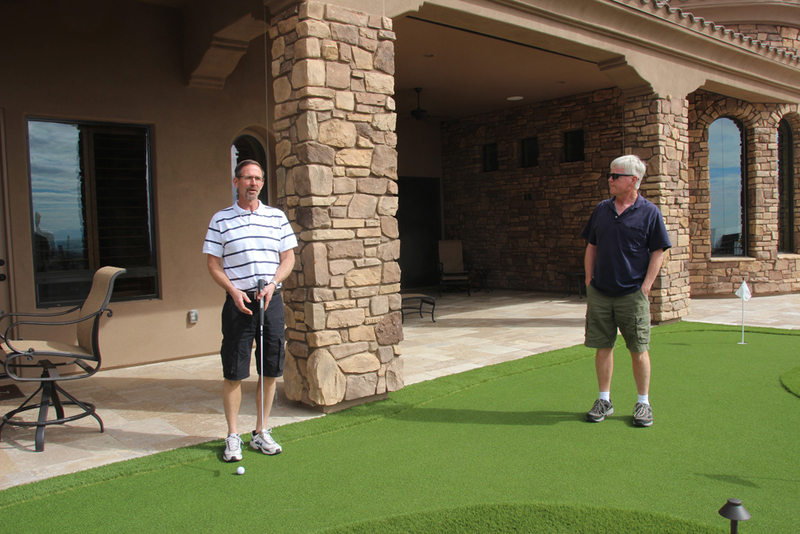 Ron and John assessing the putting green. 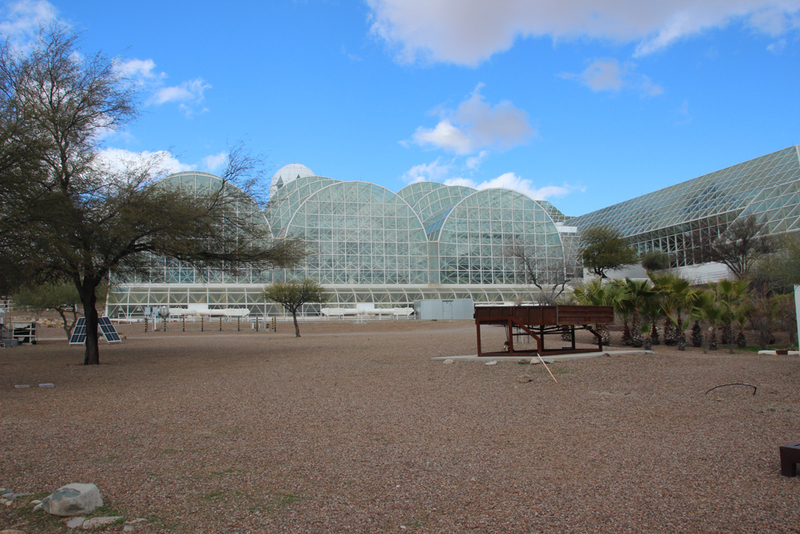 One trip was to the Biosphere 2. 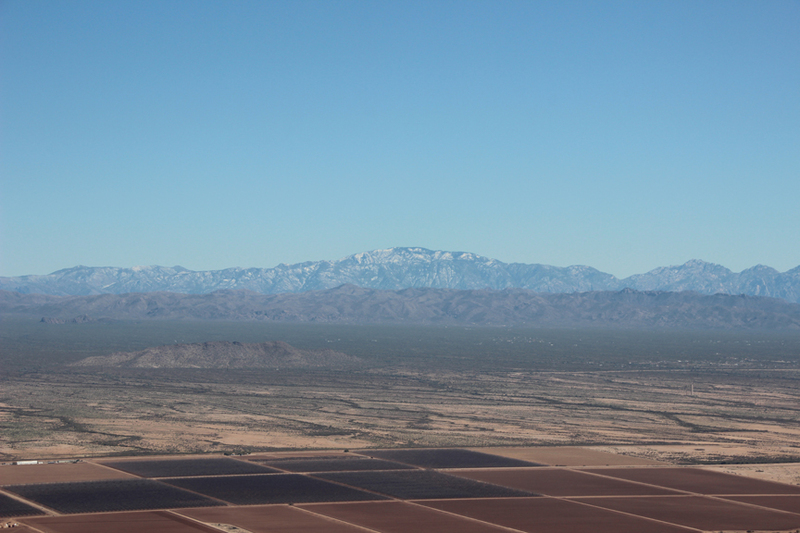 This is an American Earth system science research facility located in Oracle, Arizona. It is run by the University of Arizona. 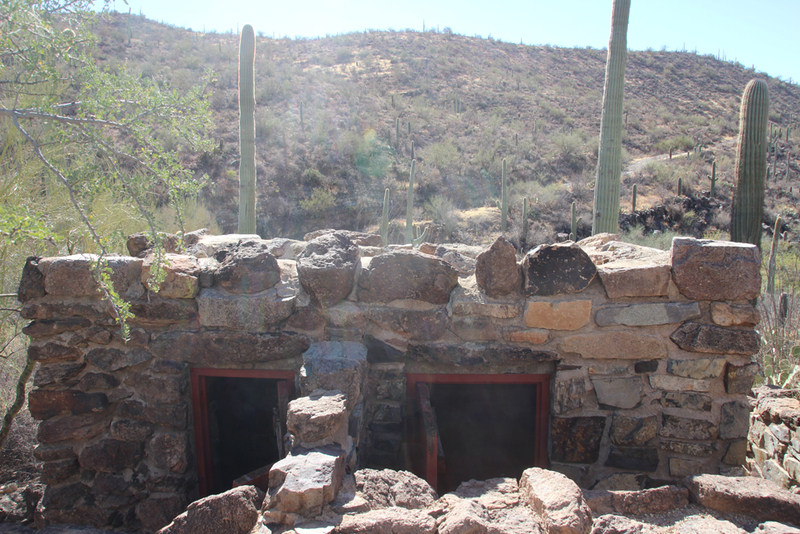 It was originally intended to house people inside to see if they can sustain living there. 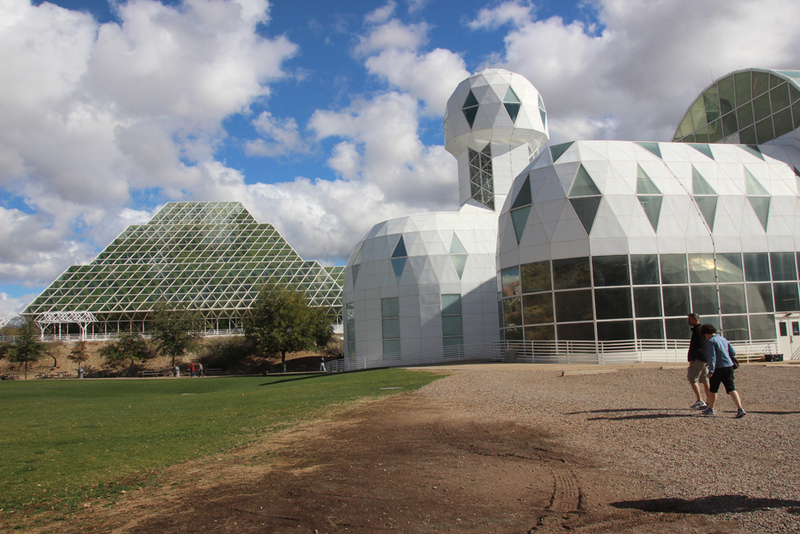 Biosphere 2 was only used twice for its original intended purposes as a closed-system experiment: once from 1991 to 1993, and the second time from March to September 1994. Both attempts, though heavily publicized, ran into problems including low amounts of food and oxygen. We did get to see it in 1994 when there were people living inside. It has changed a lot since we were there and was quite fascinating to explore. 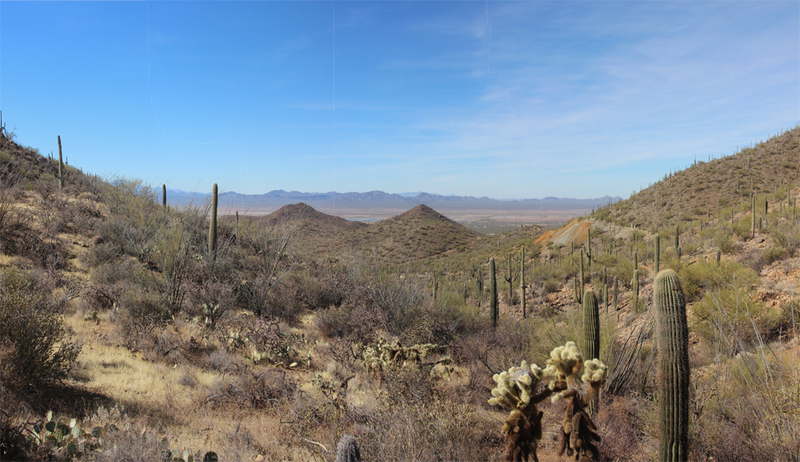 We took a trip to the the Arizona-Sonora Desert Museum in Tucson. 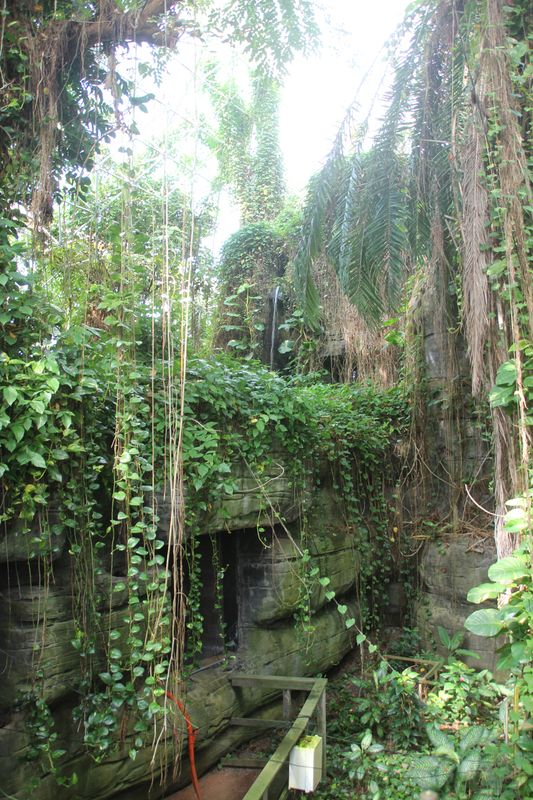 It is a 98-acre zoo, aquarium, botanical garden, natural history museum, and art gallery founded in 1952. It was a nice place to walk around and view many animals and gardens along almost 2 miles of paths and 21 acres. 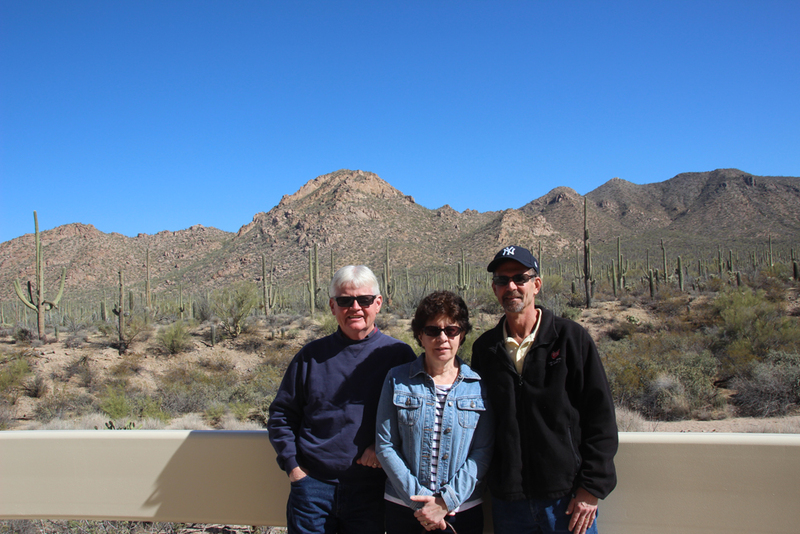 John, Pam and Ron at Saquaro National Park. 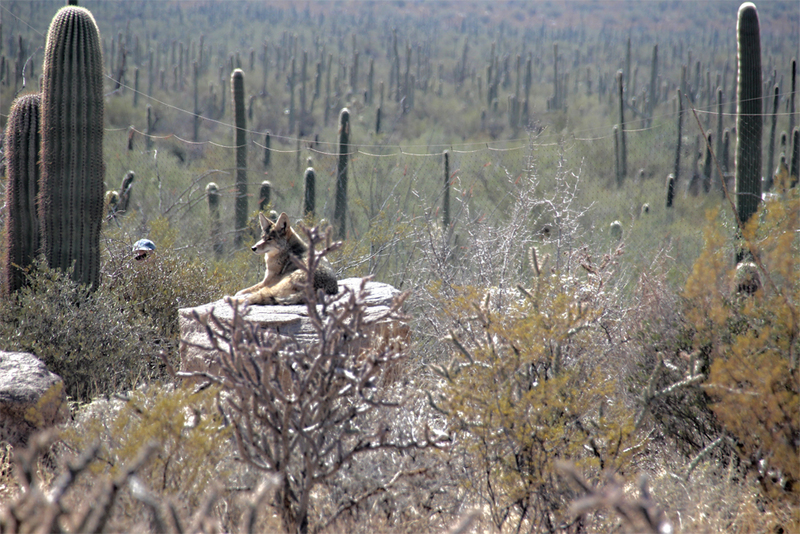 Coyote lounging in the sun. 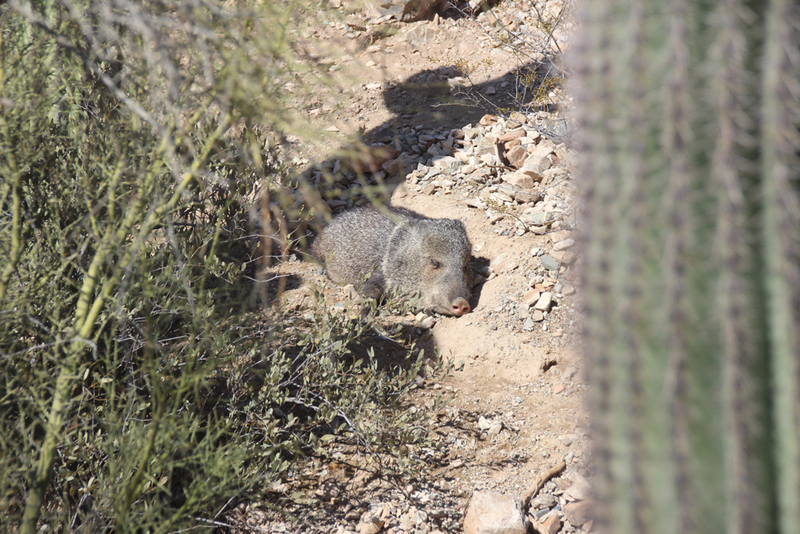 Javelina at Desert Museum. They are strange looking animals. 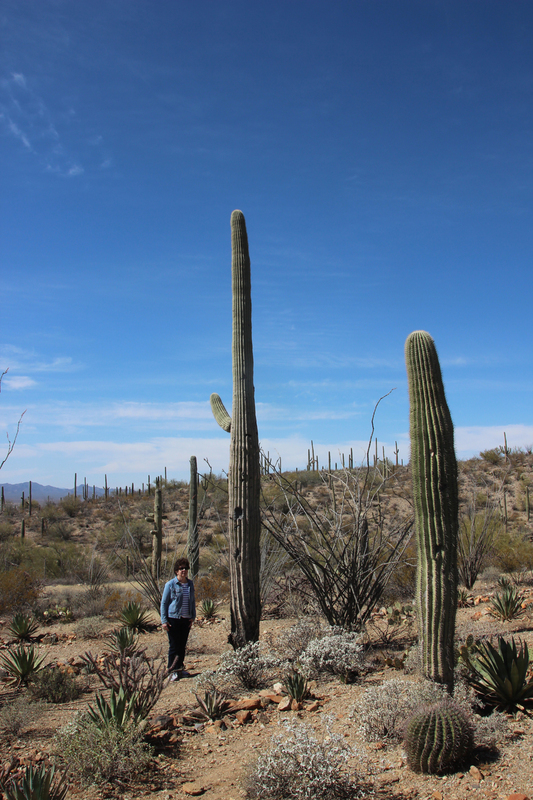 Pam showing how tall the cactus are. 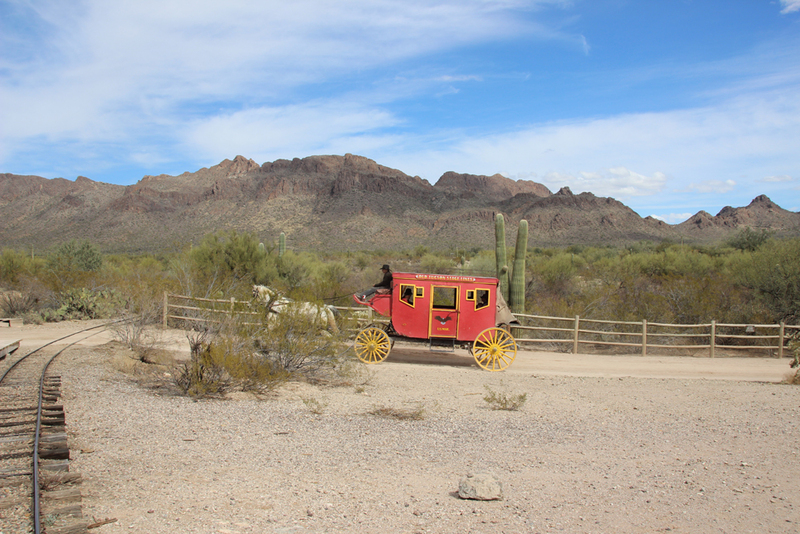 Our next trip was to Old Tucson. 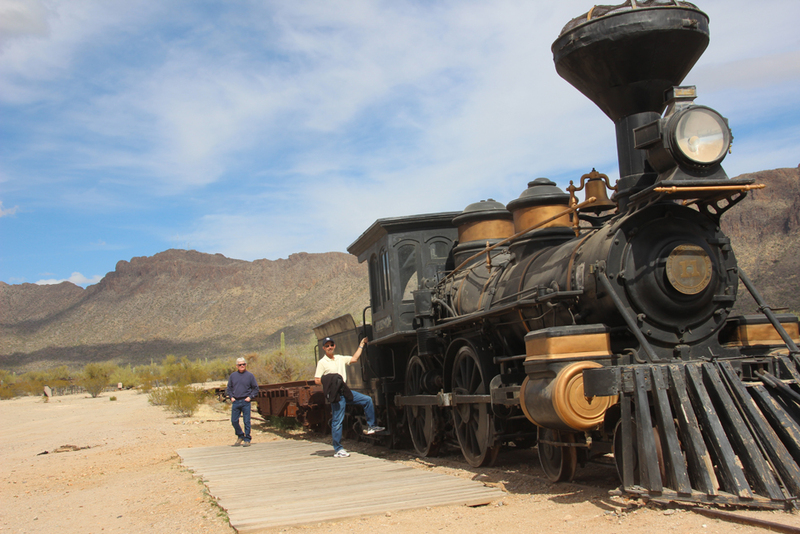 Old Tucson is a movie studio and theme park near Saguaro National Park. This wasn’t one of our favorite places but again it was a nice day to walk around. It was originally built in 1939 for the movie Arizona. Little House on the Prairie was also shot there along with many other movies. John and Ron boarding the train. 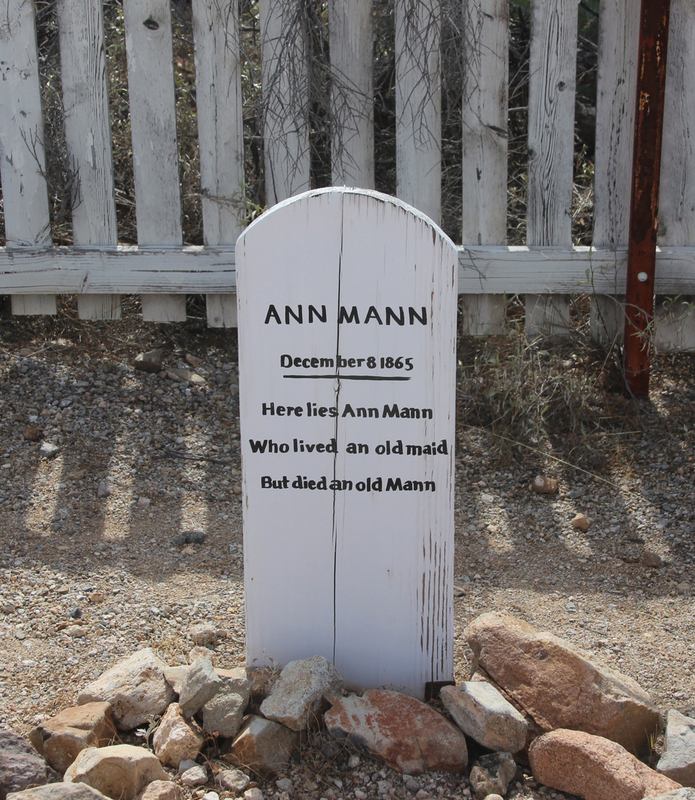 Humorous gravestones at Old Tucson. Sunset on the way back from Mesa, shot from the car. 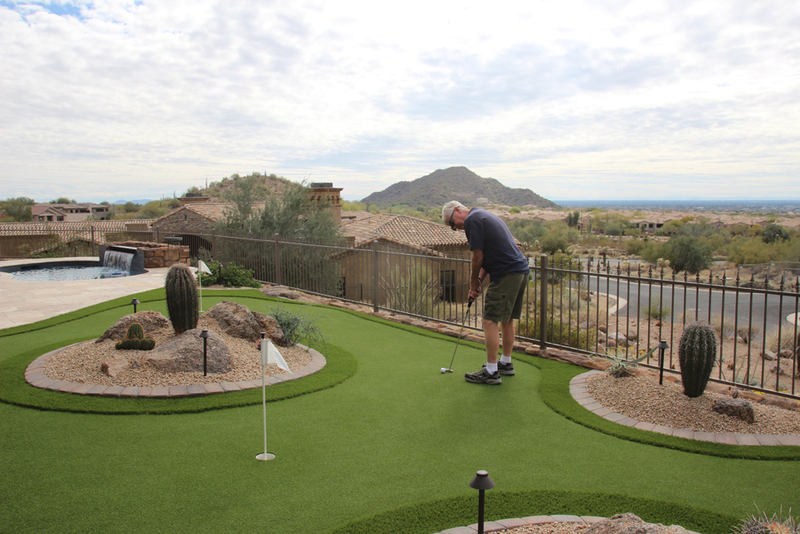 Retired life in Arizona is good. As my mother used to say, “I don’t know what I did all day, but I was busy.” That’s about what we are up to. We have taken a few day trips and our daily routine is walking the dog and playing pickleball. With any luck that is keeping us in shape. We taught Ed, Sheilah and Ken how to play pickleball. Based on the pictures, they seemed to enjoy it. 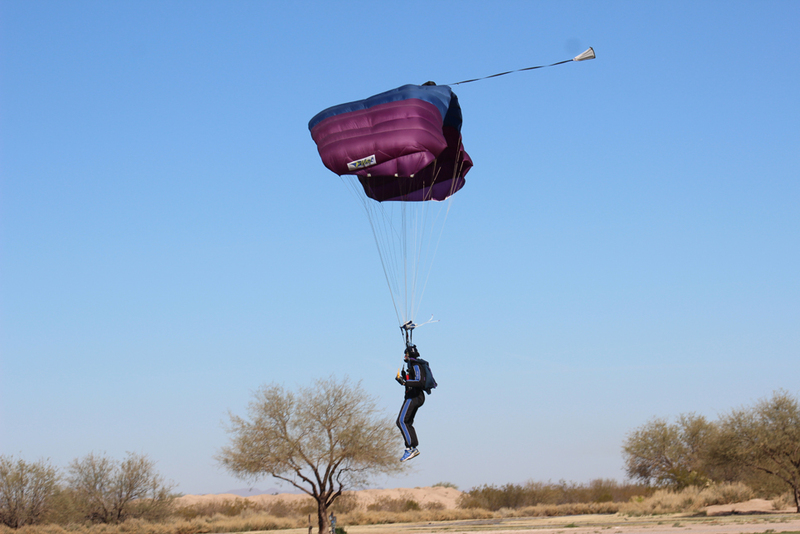 Eloy promotes the best Sky Diving place around where you can watch people parachute out of the plane. We could see the planes go up and suddenly there are all kinds of parachutes opening and drifting back to the ground. It is open for anyone to try (at a price of course) but we weren’t brave enough to try it. We know our limits. 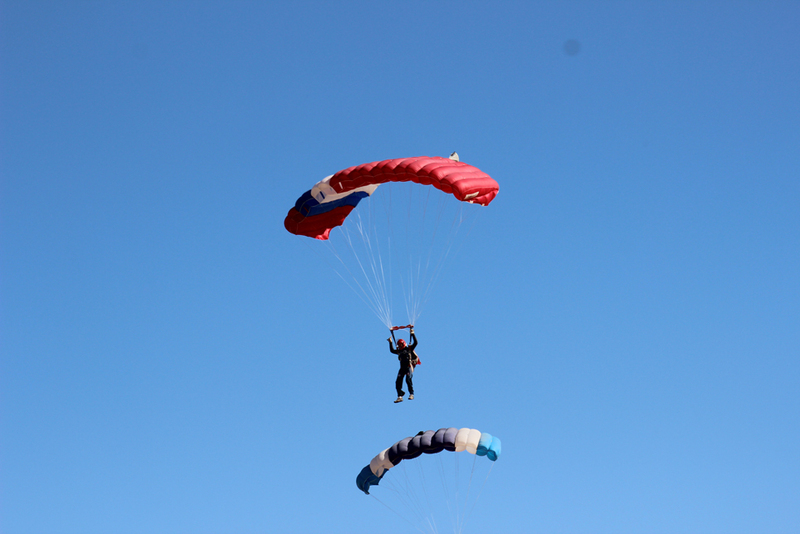 Sky divers. They weren’t as close together as this looks. 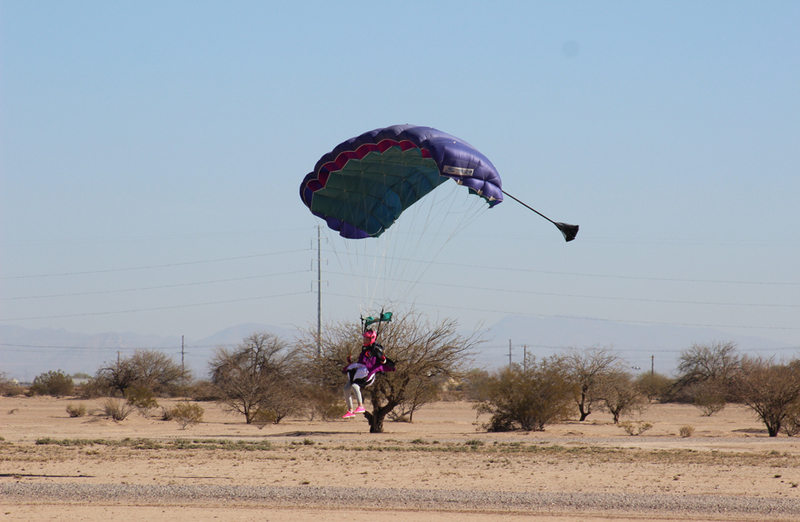 This skydiver landed in the desert instead of the nice green grass. 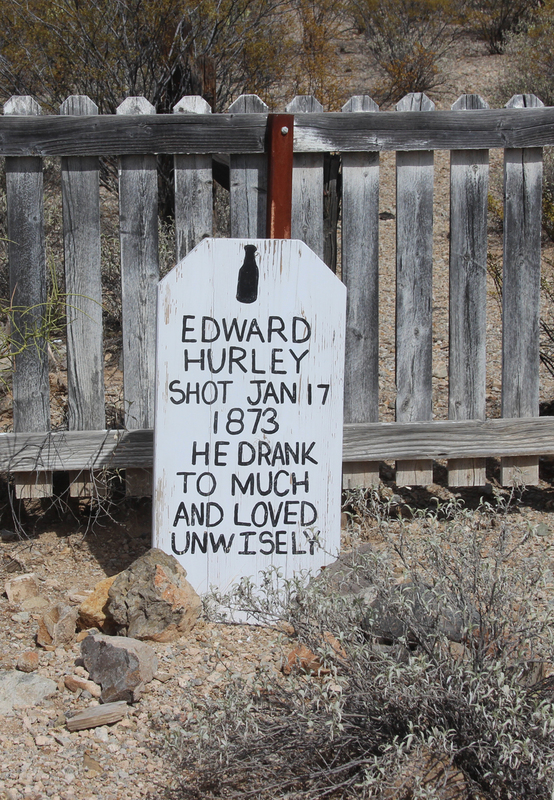 Hope he didn’t find any cactus. Coming in for a landing. 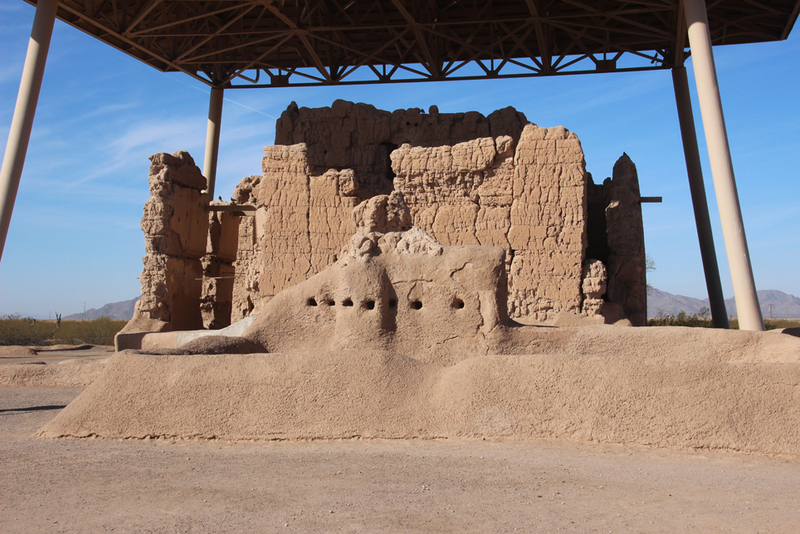 We ventured out to see Casa Grande Ruins National Monument. 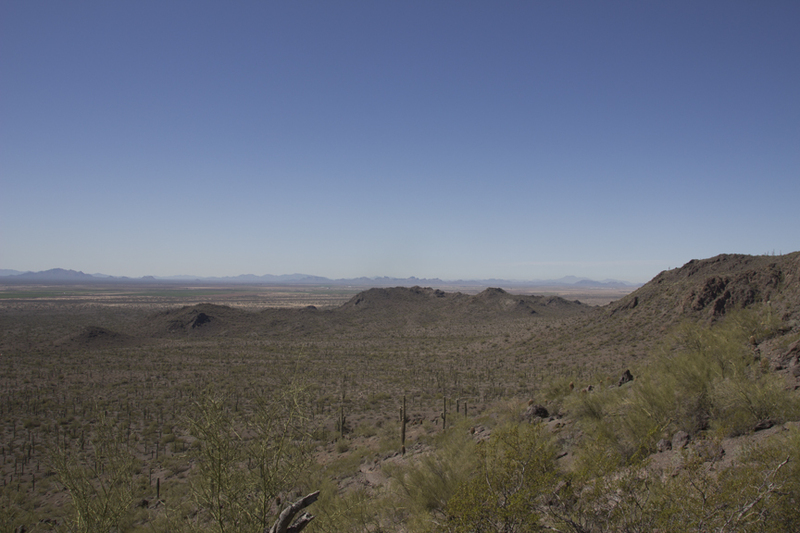 This is an Ancient Sonoran Desert People’s farming community and “Great House” over 650 years old. There is not a lot to see but it was interesting nonetheless. We didn’t watch the film they offered as we had the dog with us. Not many places allow dogs so this was a treat for Shelby to walk around here. 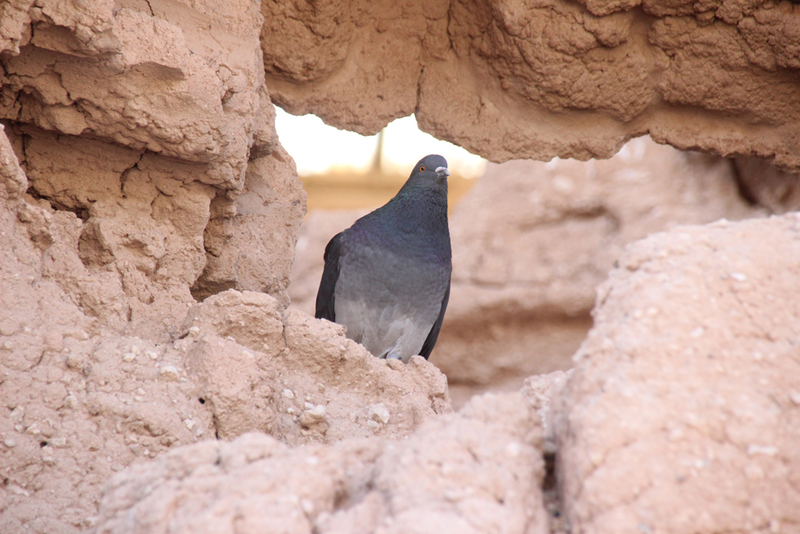 Pigeon living at the Ruins. 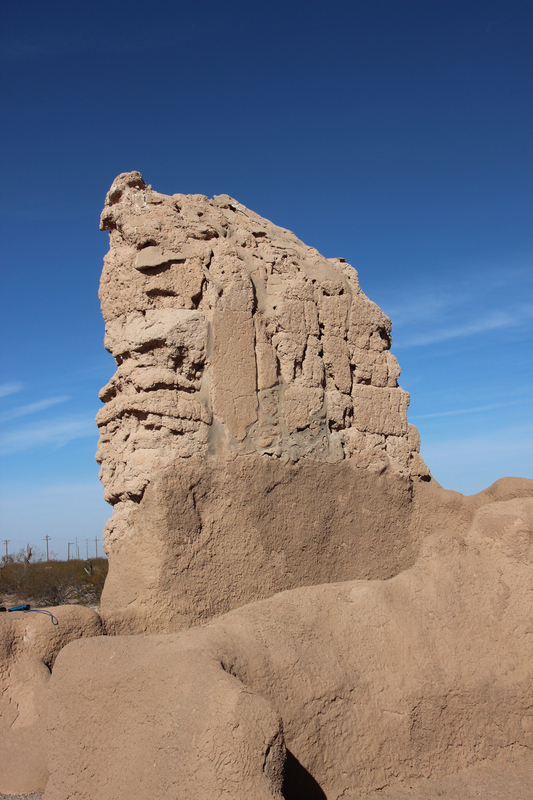 Another angle of the ruins. 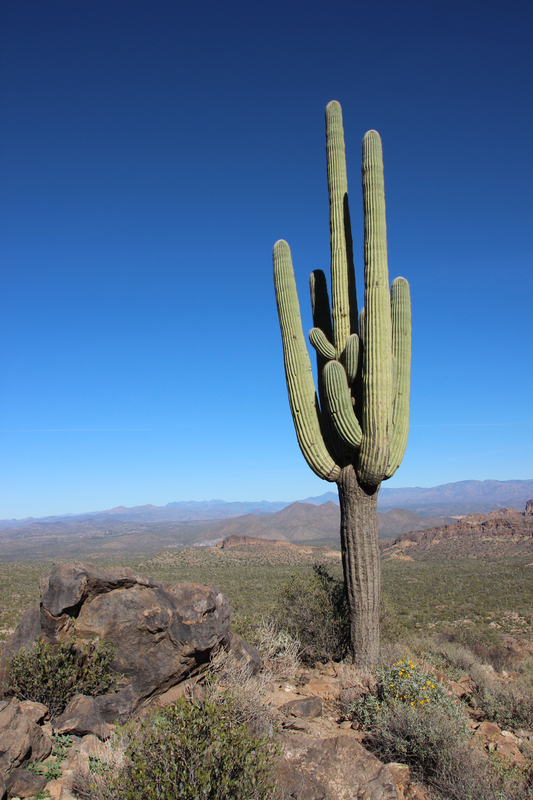 Our next trip was to Saguaro National Park in Tucson. 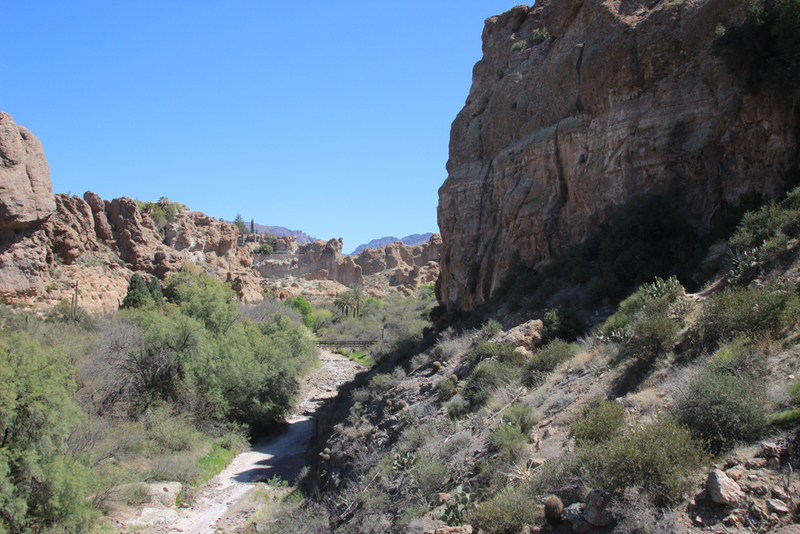 We selected one of the many beautiful days here to take a hike on King’s Canyon. 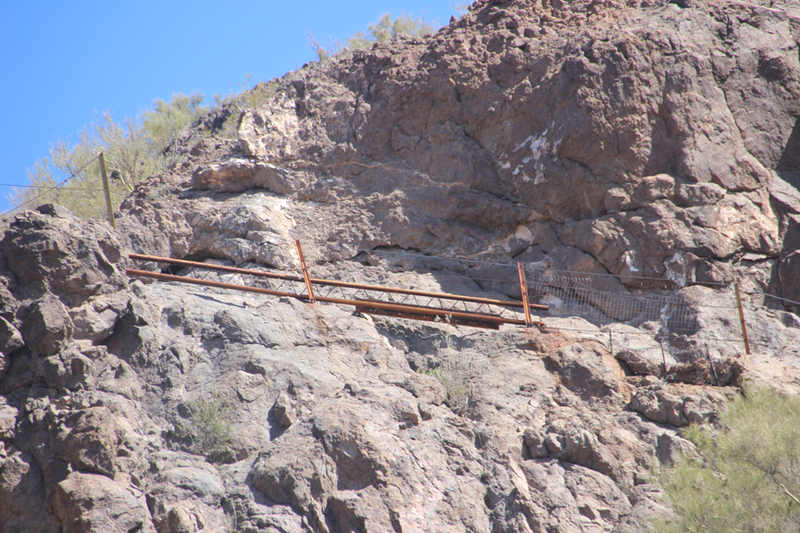 There was a copper mine called “Gould’s Mine” we could see along the trail. You can see the color to the right of the picture below. 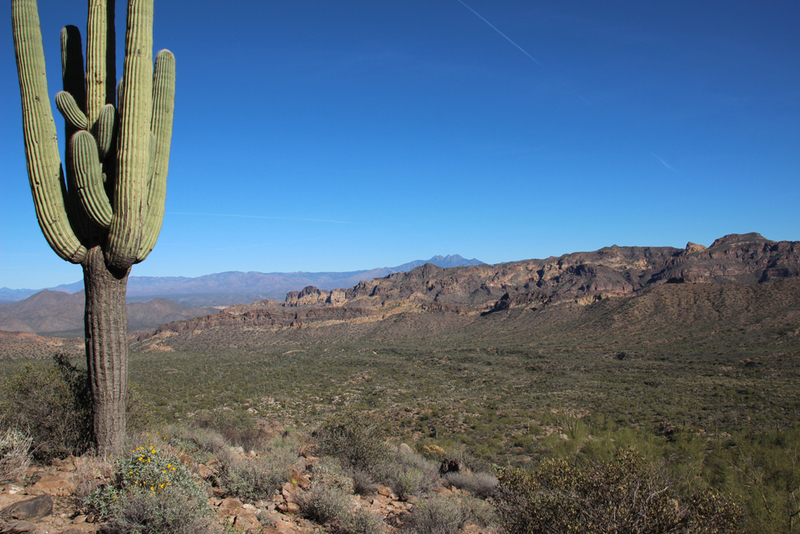 As with all national parks, are many hikes in this park to choose from. We will be going back to do others in the near future. They stored blasting powder in here for the copper mines. While Super Bowl LII was a little disappointing, it was a great game and the Patriot’s had nothing to be ashamed of. 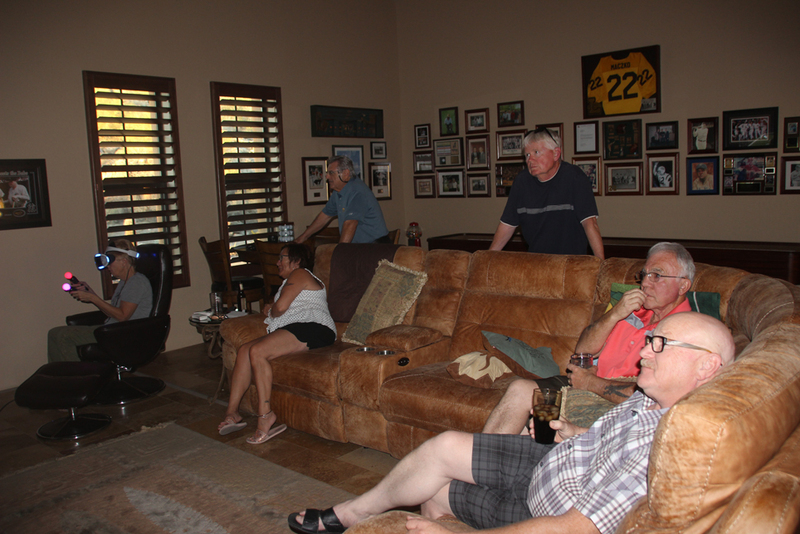 We enjoyed dinner and watching the game at Nancy’s (sister) and Ed’s house. 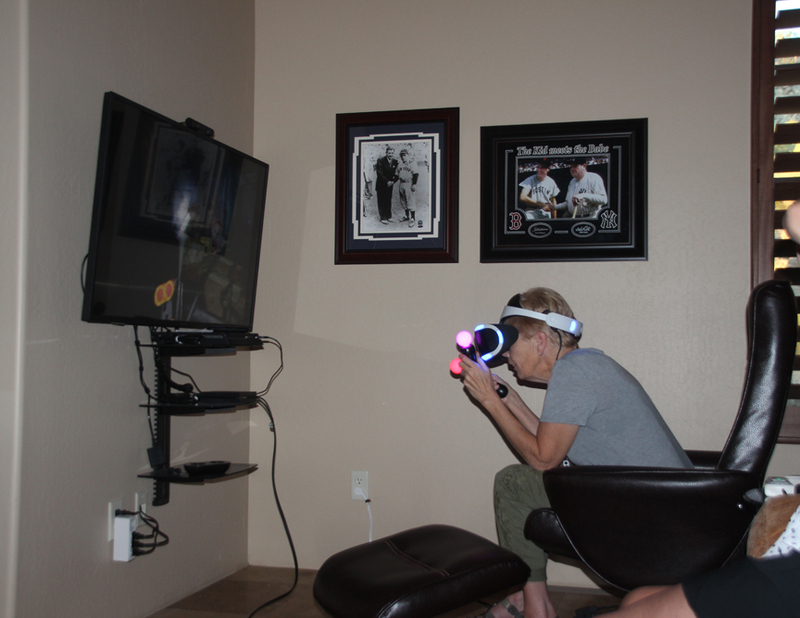 During the game, Sheilah got to try out the virtual reality game. If you get motion sickness this is not the game to try. Sheilah exploring the virtual reality game. Hope everyone back East is coping with the snow and ice. Spring has be to just around the corner. 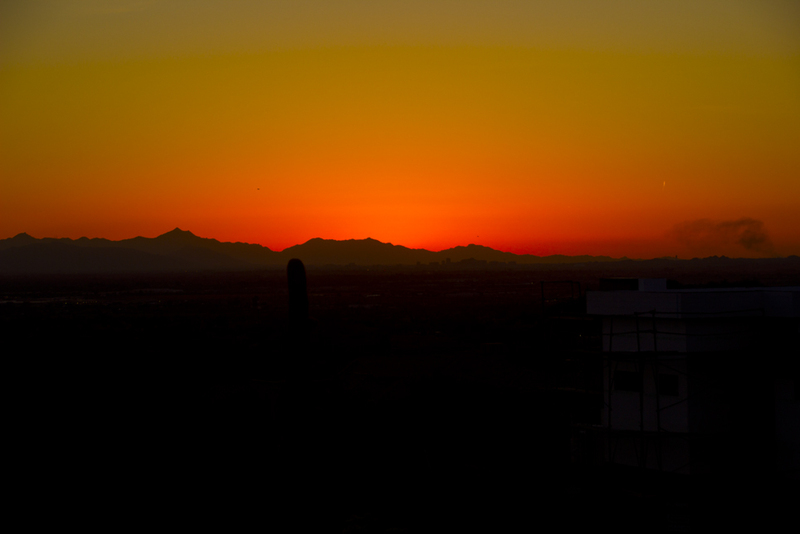 We are settling into our Arizona routine and enjoying every bit of it. The weather has been wonderful at 70+ degrees most of the time. We did have a few cooler days with lows in the 20s but warming up to 60 during the day. We certainly aren’t complaining about the temps here especially when we look at the weather of snow, ice, and rain at home. The sky is a beautiful color morning and evening. Sunrise looking toward golf course from our house. 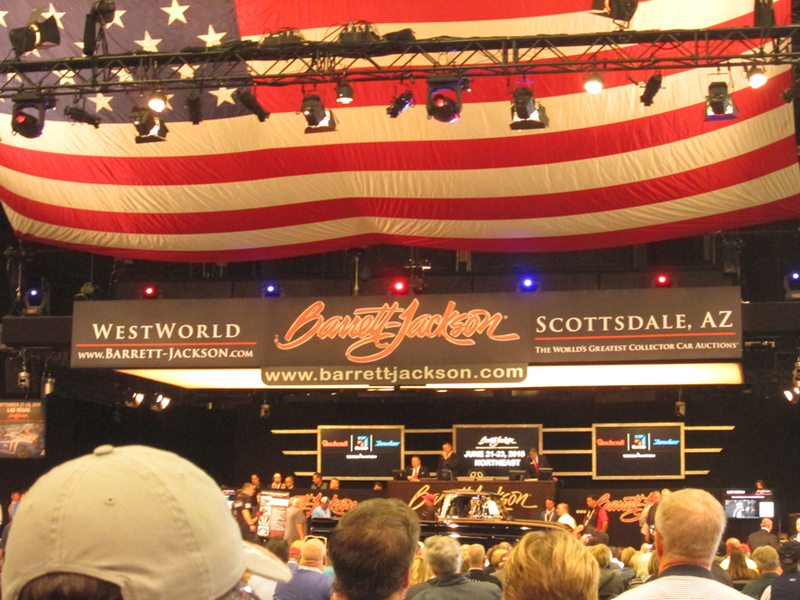 We went to the Barrett-Jackson car auction in Scottsdale. Towards the end we were on car overload but the number and types of cars were something to see. It was fun to actually see the auction in person vs. watching it on TV. This year the total sales were $116.7 million. There were many celebrities there including George W. Bush, Jay Leno, Tim Allen and more. Unfortunately the day we went we did not see any of them. But I think the rest of the people in the state were there based on trying to park and walk around through the crowds. Luckily we went with my sister and brother-in-law and some friends who drove their cars. We are just not used to this amount of traffic. 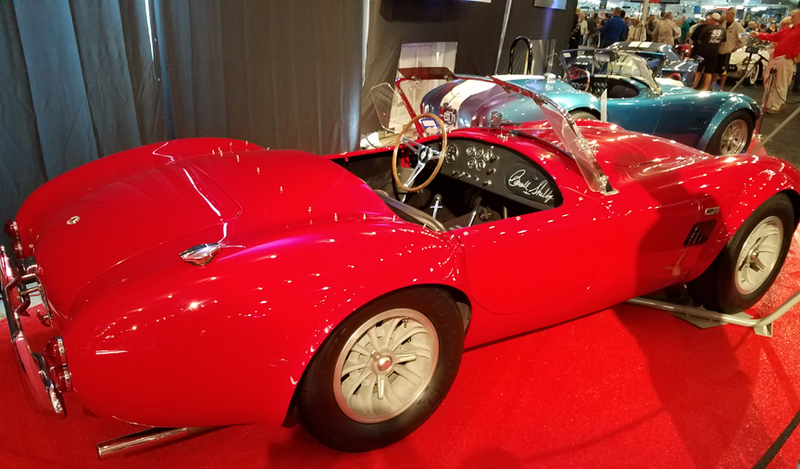 A Carol Shelby Cobra on display. Wouldn’t mind having one of these. 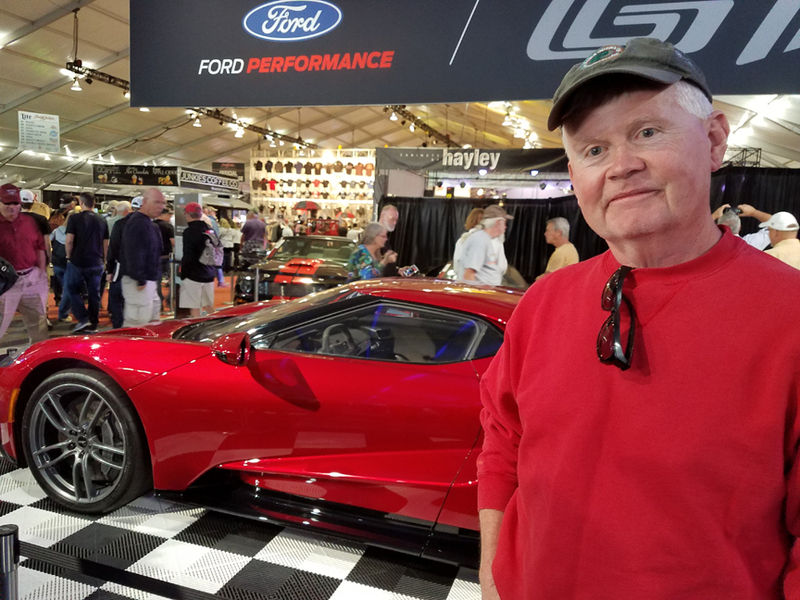 John dreaming about which car he’d like to buy. In the room where they auction all the cars. 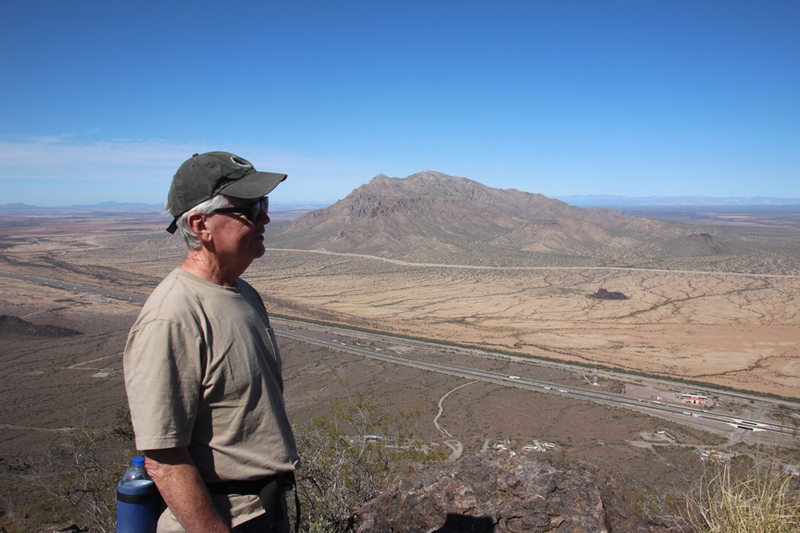 Another day, we hiked around Usery Mountain with our friend Ken. 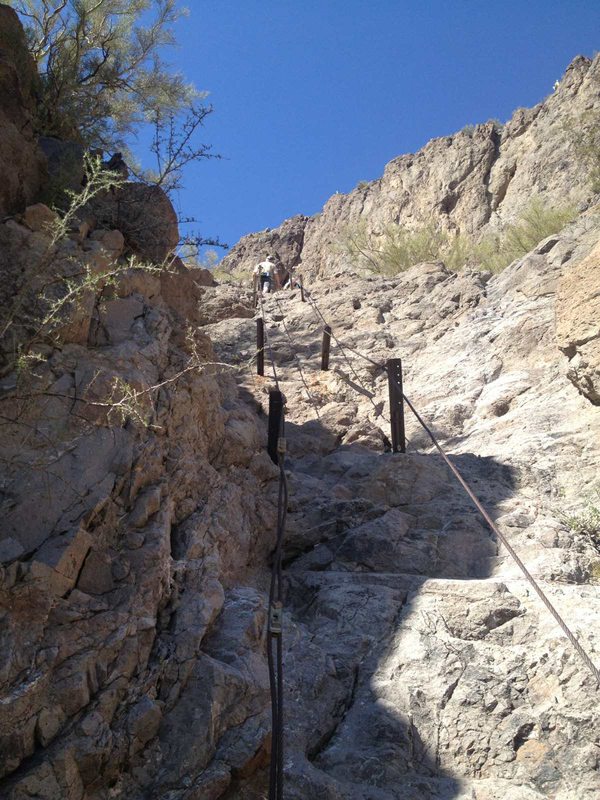 It is a great 7.5 mile hike—long but not too steep. The views were very nice. Ken at top of Usery. We were still far behind him. Can you see John in this picture? About 2/3 down in tan shirt. 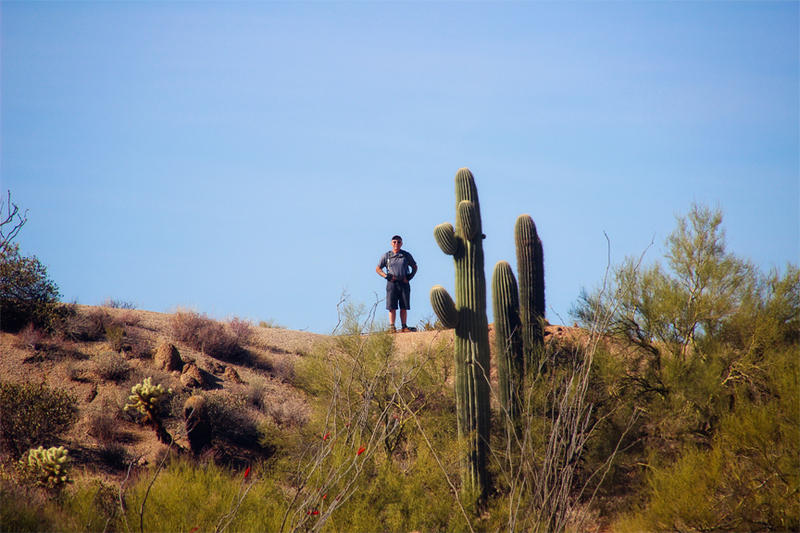 Another shot walking around Usery Mountain. The rest of our days have consisted of walking the dog on the golf course so he can look for rabbits and getting a few hours of pickleball in just to say we are staying active. 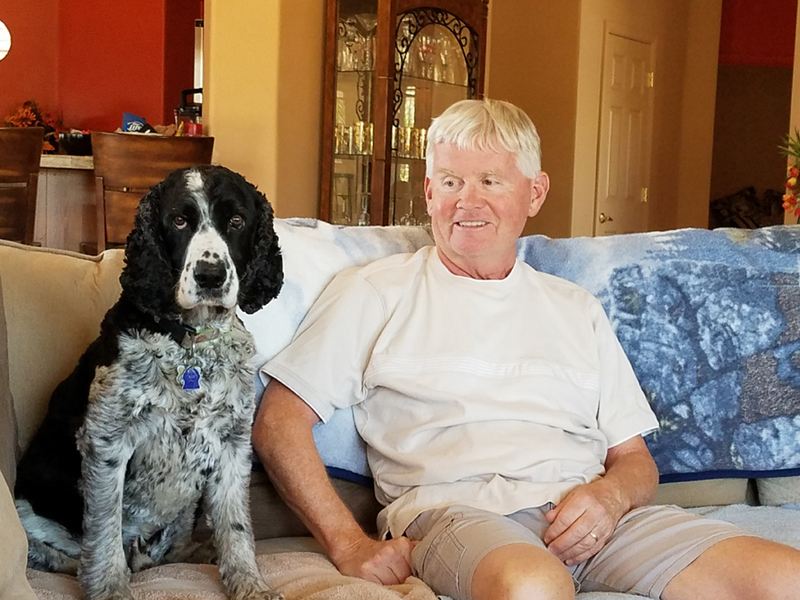 John and Shelby did see some coyotes on one of their walks around the golf course. 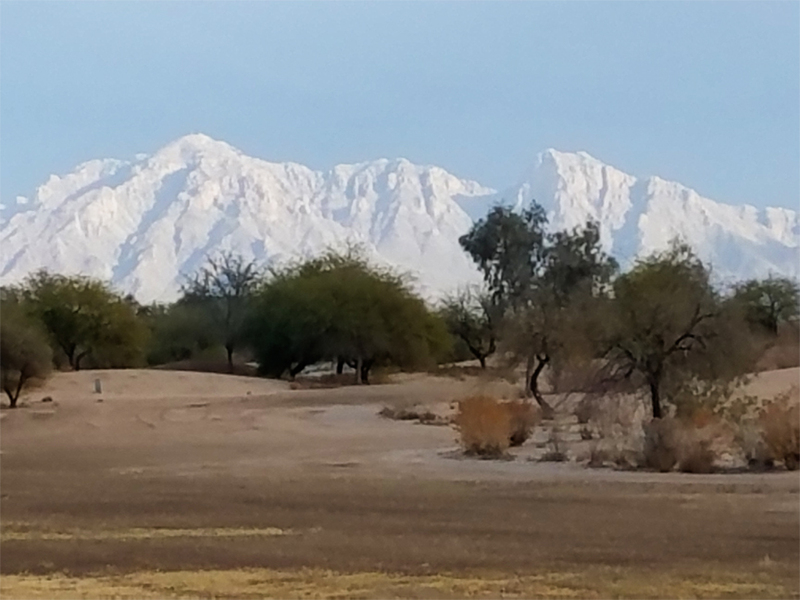 The light was shining on these mountains making it look like snow. It was really just sand. This is the golf course we walk around. 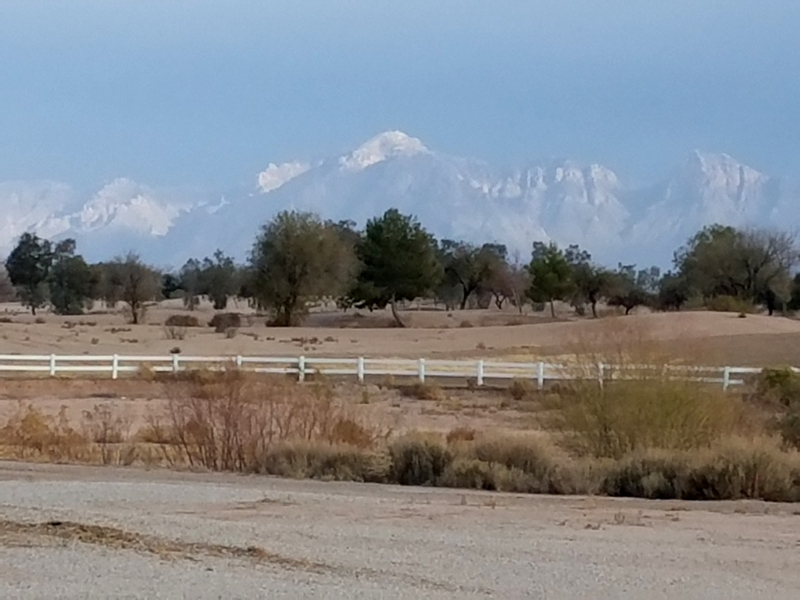 Another view of the fake snow-capped mountains. Seven days and 3,000 miles we finally arrived in Eloy, Arizona on Monday, January 8th. We lucked out with the weather across the country. We were ahead of the nasty storm in the east. When we got to Chambersburg, PA there were a few flurries and that is all we got for snow. 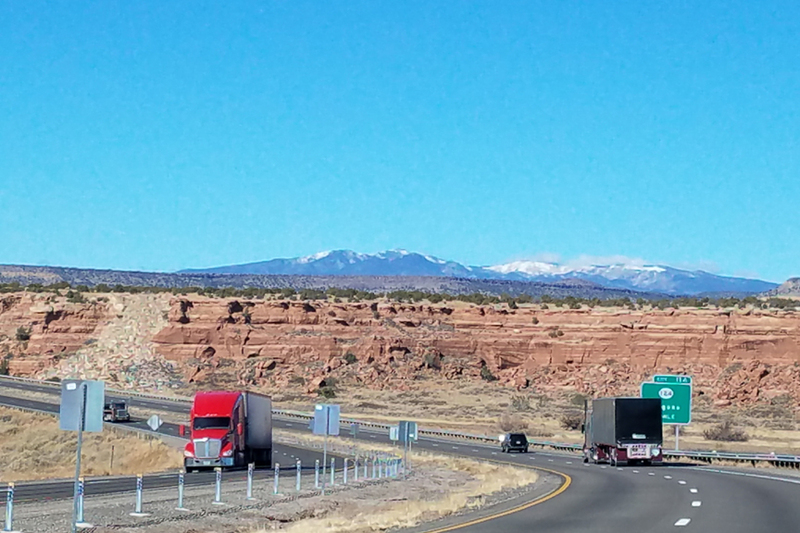 The cold did last until New Mexico but we hit 70 degrees as we came across into Arizona. We can live with that. Look temps hit 70 as we got into Arizona. What a treat! Shelby was amazing the whole ride. We had a tupperware container (yes it was actually Tupperware and I know I am dating myself admitting that) filled with water. Whenever he wanted water he just tapped on the bowl and voila, his master gave him water. We stopped to let him out to stretch his legs quite often and when we got back in the car, he just sat up until he got his treat. I guess we know who is in charge. 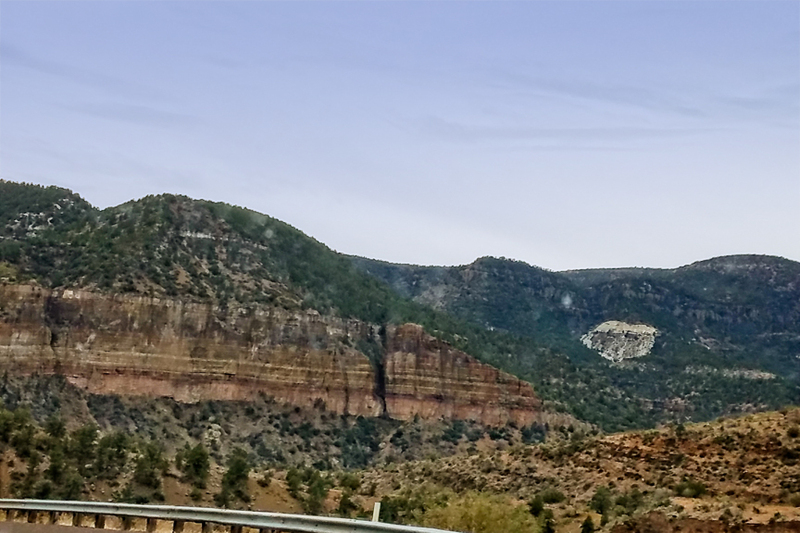 The drive from New Mexico to Arizona was really nice. We took the scenic road for our last day and it was very pretty. 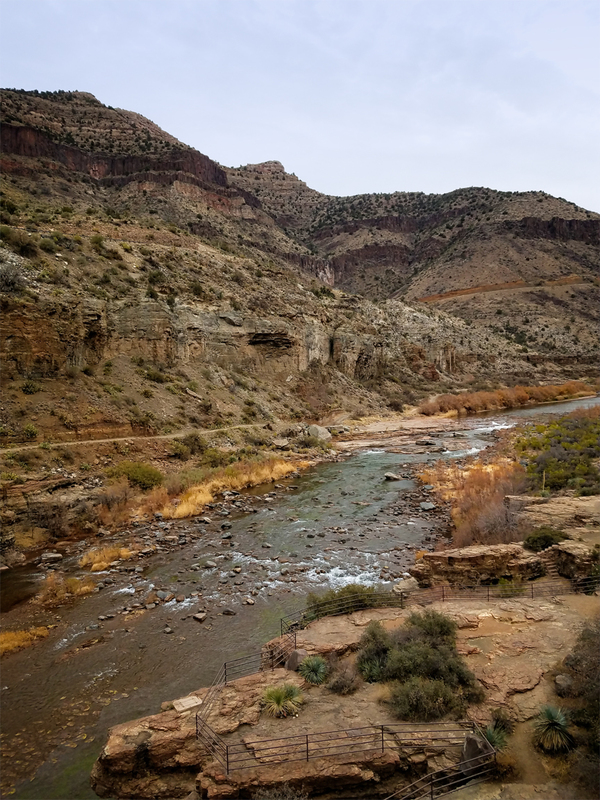 From snow-capped mountains to Salt River Canyon it was a pretty sight. The community in Eloy where are we are renting is very nice. We have met a few people and talked with some who played pickleball. John and I went down today to play for an hour. No one was around but we will connect up with others another day. There is also a pool, spa and exercise room which we will take advantage of. The house is on the 7th tee of a golf course. Unfortunately, the golf course has been closed for 2 years so all the nice greens are brown. It is nice to be able to walk Shelby though. There are plenty of rabbits for him to chase. 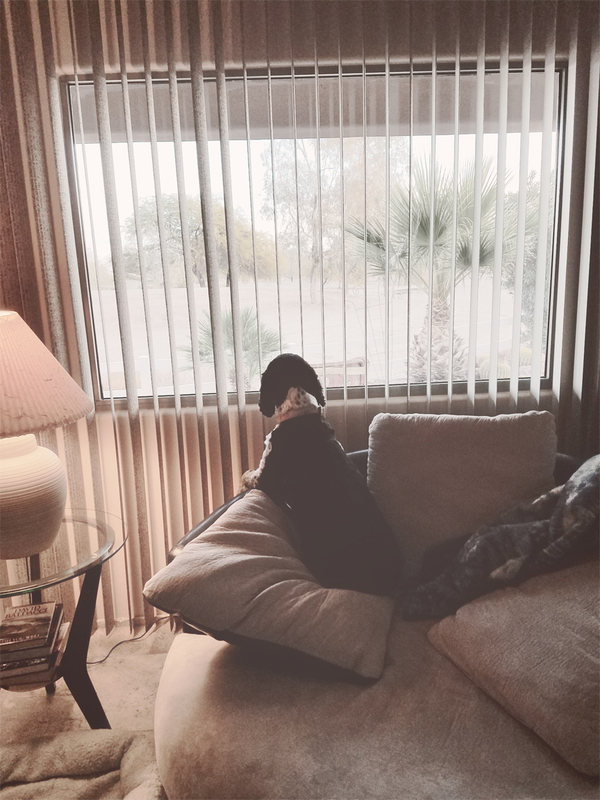 Shelby checking out the view from the living room. Our house is quite nice and how wonderful it is to sit outside for cocktail time. We are thinking the long drive out was worth being able to sit and enjoy the warm weather.